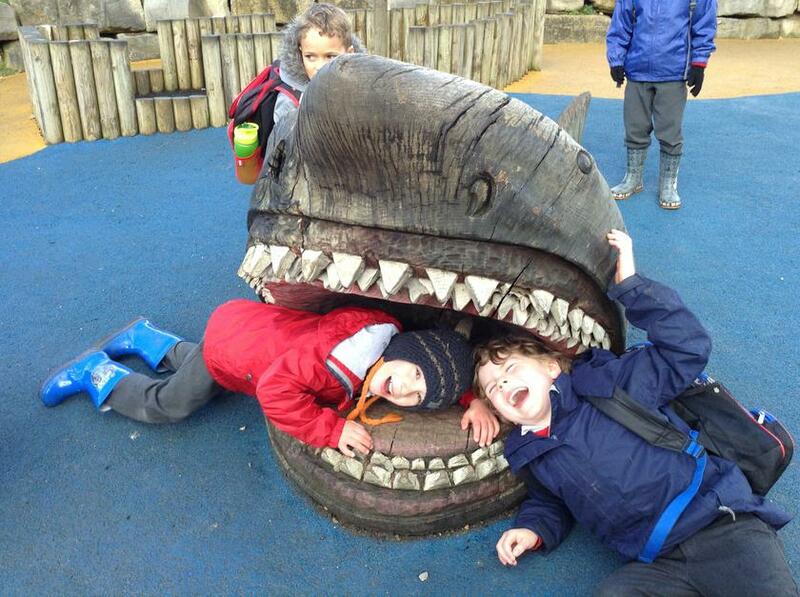 We have had a very active and fun-filled week in Year R/1. The children worked hard this week practising for our sports day races and we were so proud of them today when they took part in the races in front of friends and family. 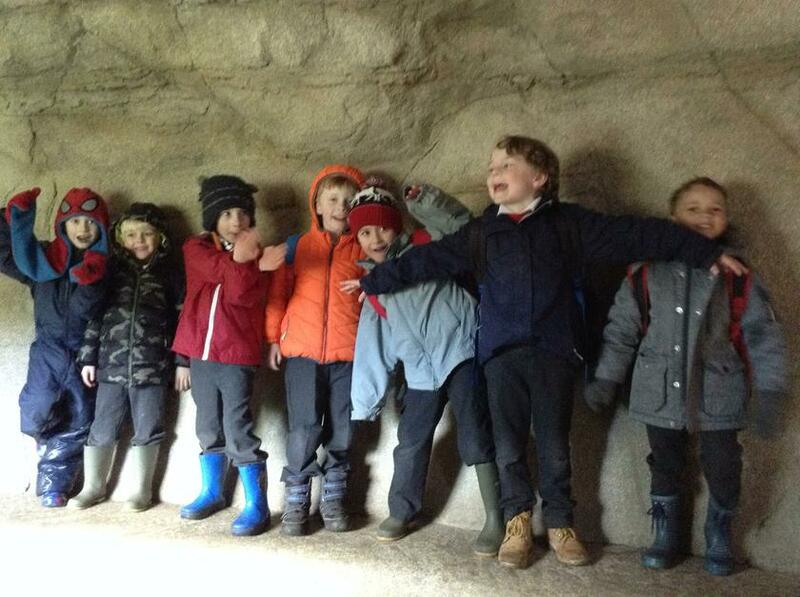 The children showed determination and excellent team spirit! The website will be including photos from the day in due course so please watch this space for those. In our Year groups we have also taken a keen interest in the World Cup and we have been making predictions of final scores. 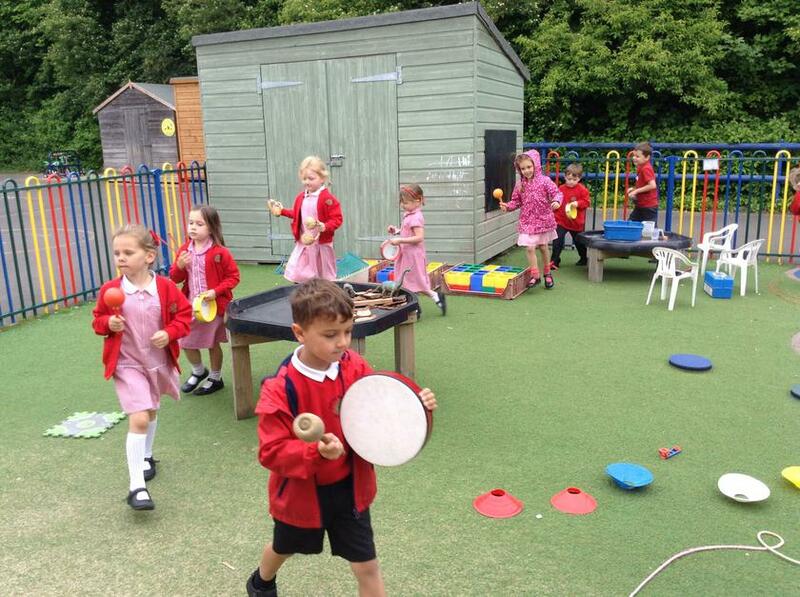 In our outside area the Year R children have been undertaking their own football matches and each person has been given specific roles to undertake. Along with the football players themselves we have had referees, someone to keep count of goals scored and even someone in charge of a rest station for players to take turns and have a much needed water break! 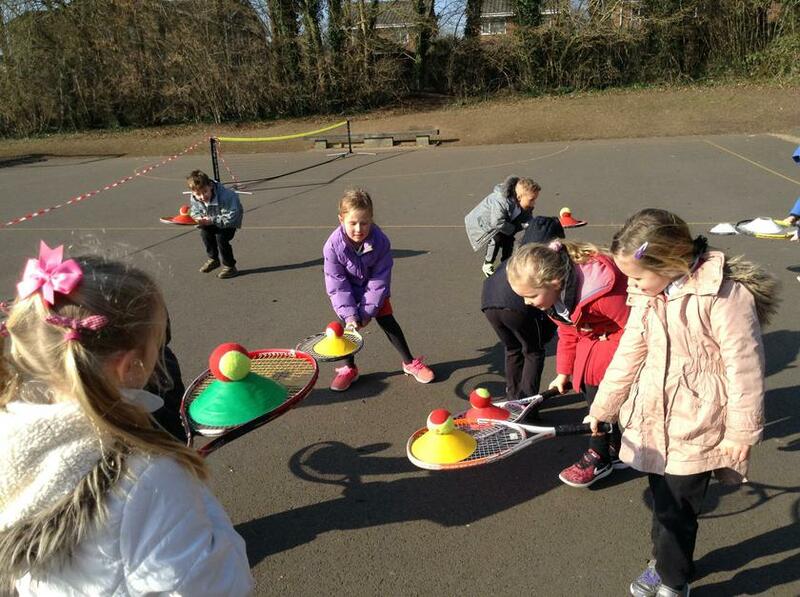 It has been lovely to see the children working as a team and taking such a keen interest in this sporting event. What a busy week for us all! 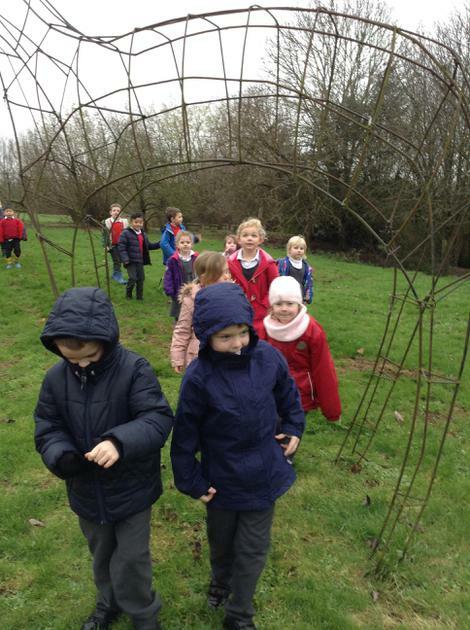 The Year R and Year 1 children have been looking closely at our own school environment and the environment at South Wonston Park. 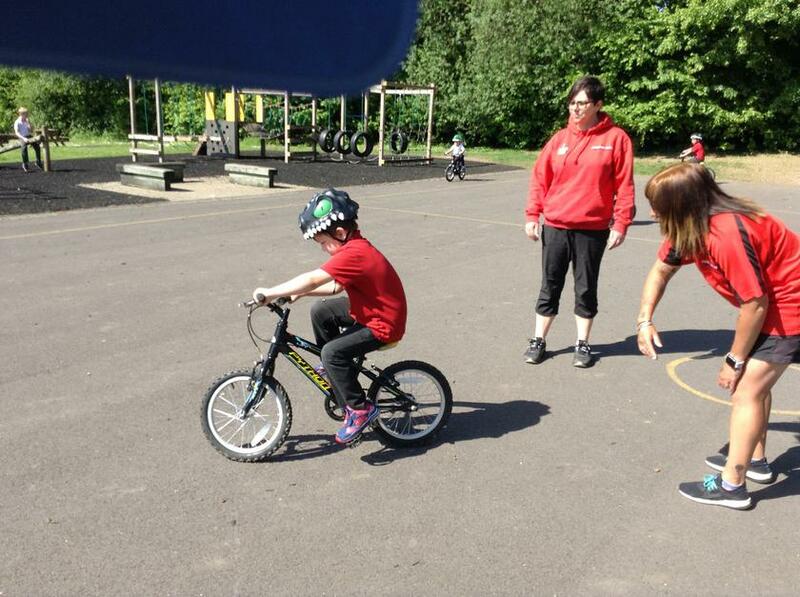 We observed the signs of summer and all the facilities we can use at the park. 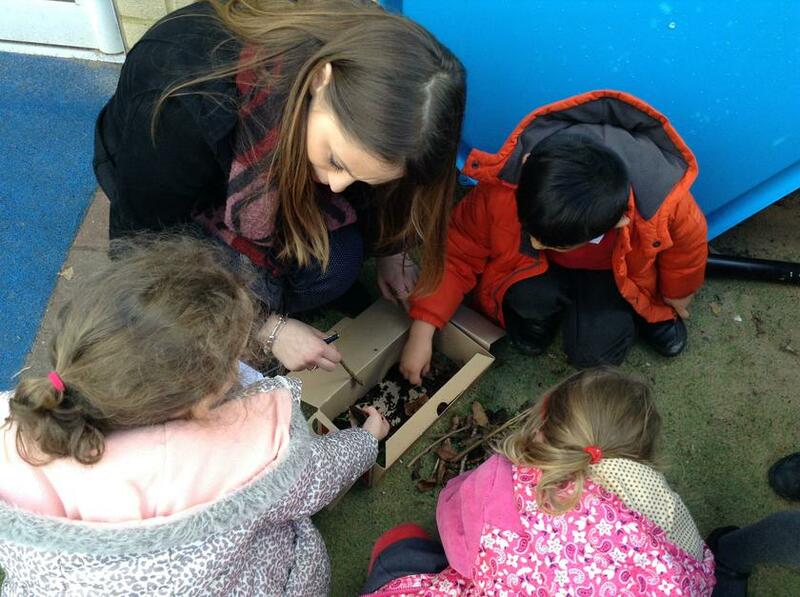 We are going to be thinking carefully about how the park is used and if we can think of ways to make it better. 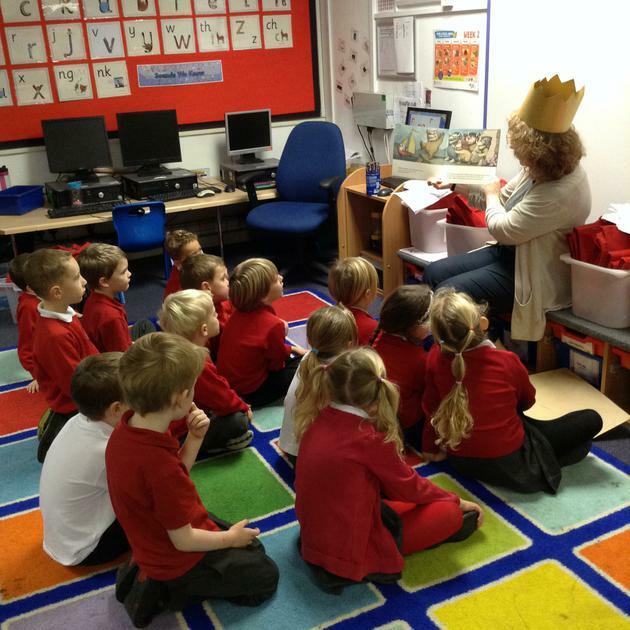 The Year 1 children thoroughly enjoyed reading the story of 'The Leaf Man.' this week. 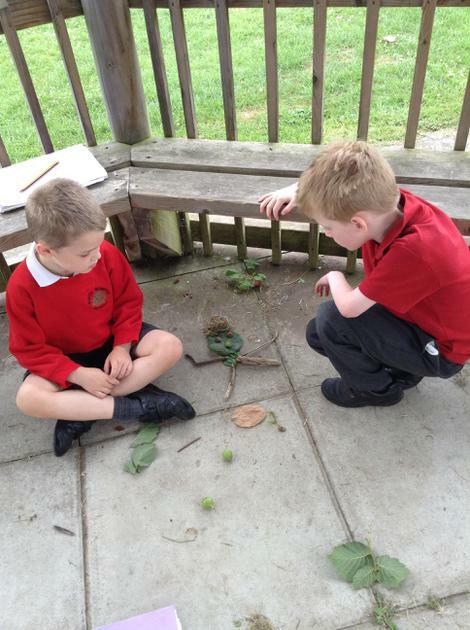 The children went on to make their own leaf person and used these to write an alternative version of the story. We hope you like our designs! The children have been using their senses and working hard on including interesting adjectives in their writing too. In Maths the Year R children have been exploring the concept of sharing items into equal sized groups. 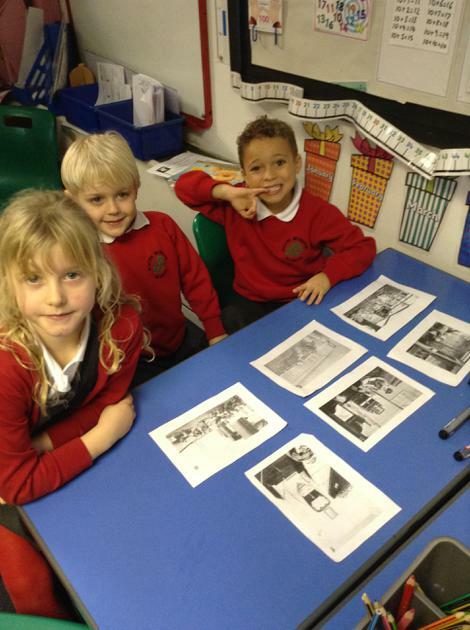 They have had a go at recording their findings using pictures and number sentences. The Year 1 children have been exploring partitioning two digit numbers into tens and ones and writing corresponding number sentences. What a busy week! 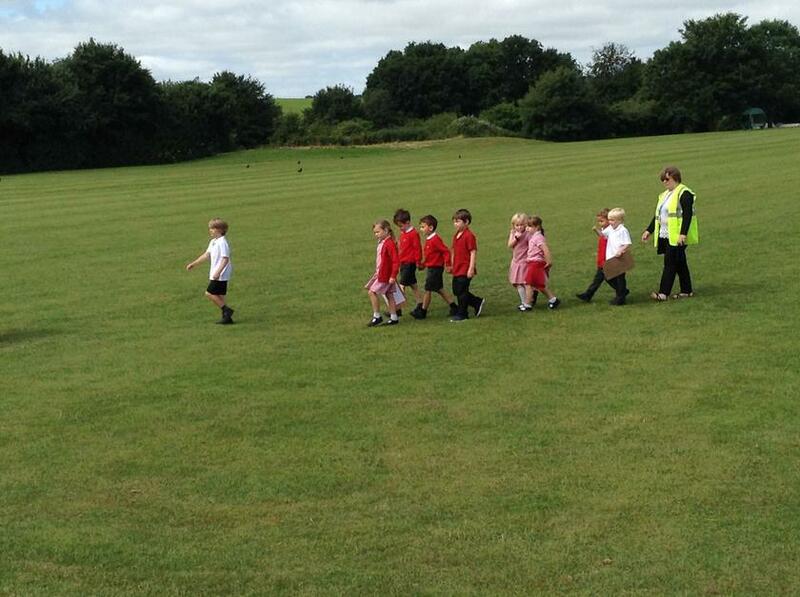 This week Year R and Year 1 Badgers went on a walk around the school grounds. 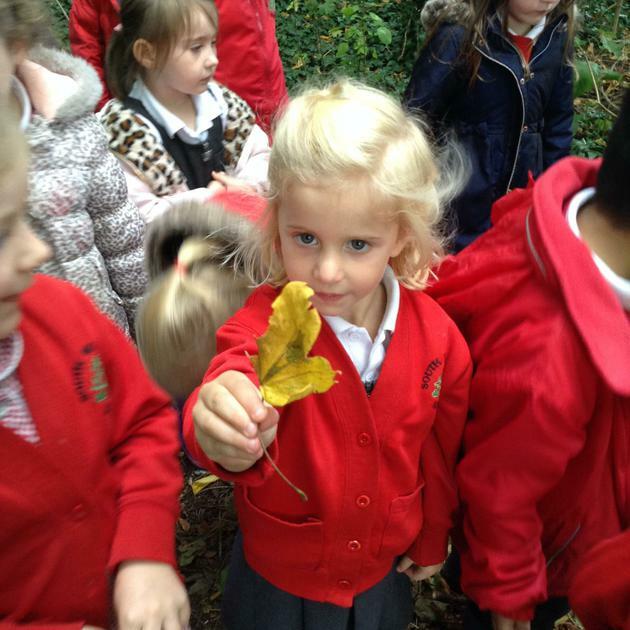 We enjoyed finding different shaped leaves and looking at the shapes of the trees in the grounds. Our challenge was to keep a tally chart of how many trees were deciduous and how many trees were evergreen. To our surprise most trees were deciduous. We saw more evergreen trees in the gardens next to the grounds. 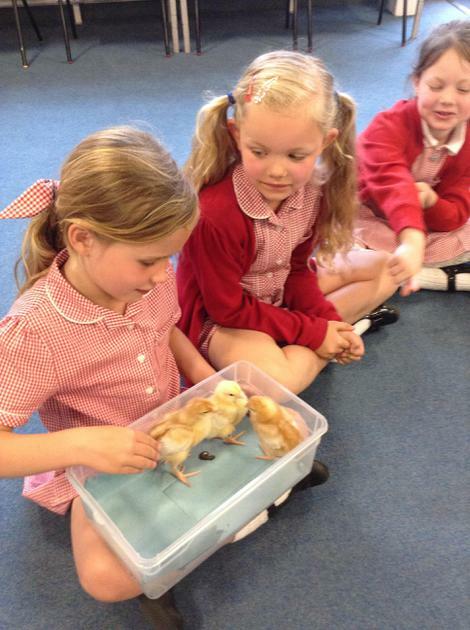 Year 1 also enjoyed looking at the chicks that we have hatched at school. They have kept a daily diary tracking the growth of the chicks. Year R have been practising their mathematical skills of counting on from a given number. We rolled a numbered dice and this helped us to choose a starting point and then we rolled another dice with spots on to add on the second amount. 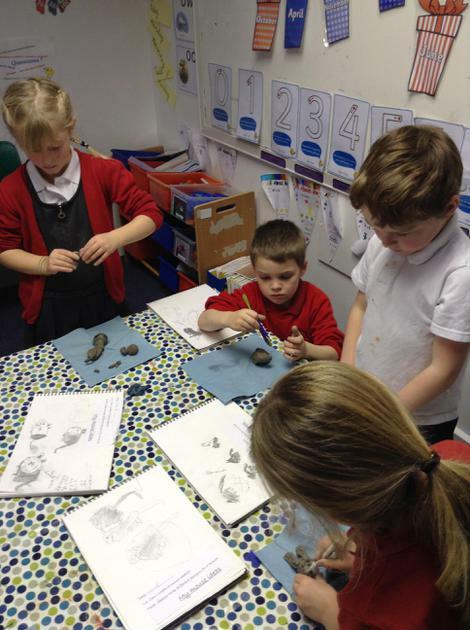 We have been really impressed with how the children have been working hard on developing this skill. 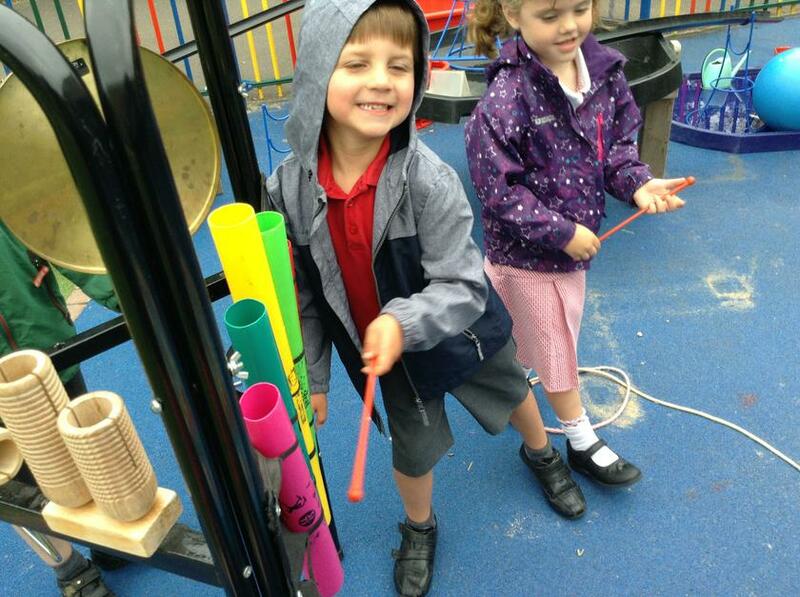 We also had a lovely musical morning and took some of the free standing musical instruments outside to explore. 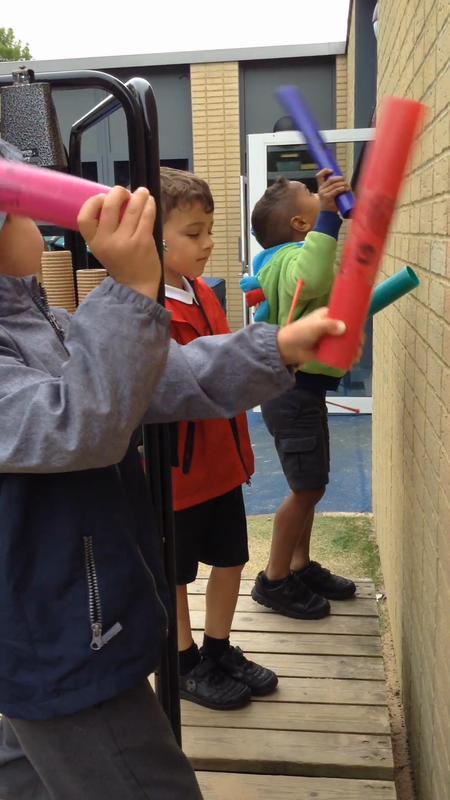 The children enjoyed listening to the sounds that they could create and we took the opportunity to record some of their musical pieces. 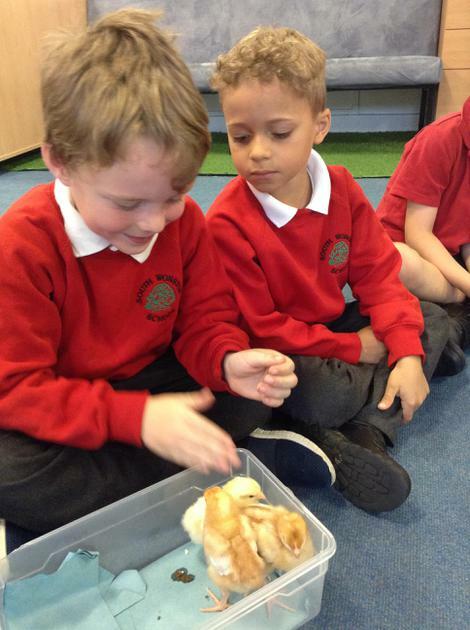 The Year 1 children have been very excited about the arrival of our chick eggs. Out of the ten eggs we have been able to observe the hatching of seven chicks. So far, we have four female chicks and three male chicks. To record our findings we have begun creating our own chick diaries and we are very excited to see what developments will have occurred over the weekend! This week has been very exciting because we got the opportunity to walk to Worthy Down on the new path. On the way we spotted different wildlife and even Winchester City itself. When we arrived we were welcomed by community members and had a lovely drink and some fruit . 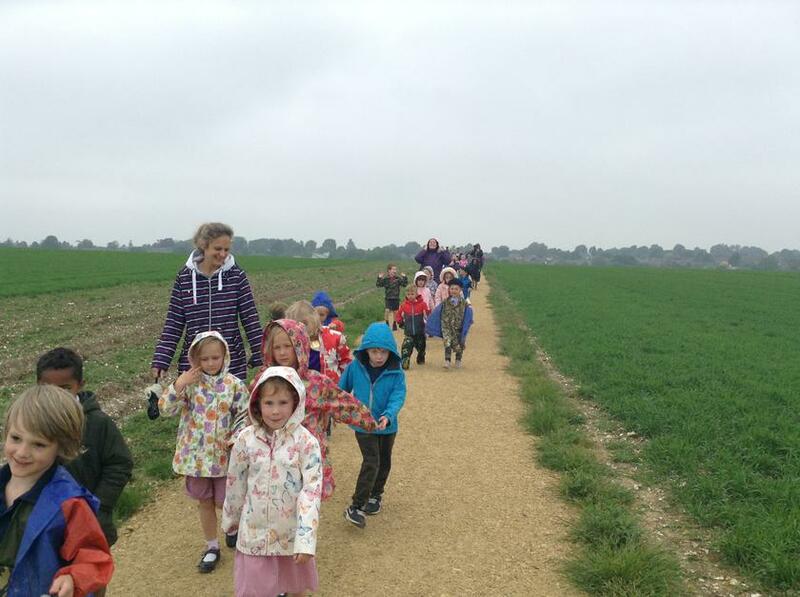 Then we walked back to school singing songs and spotting the school on the horizon. 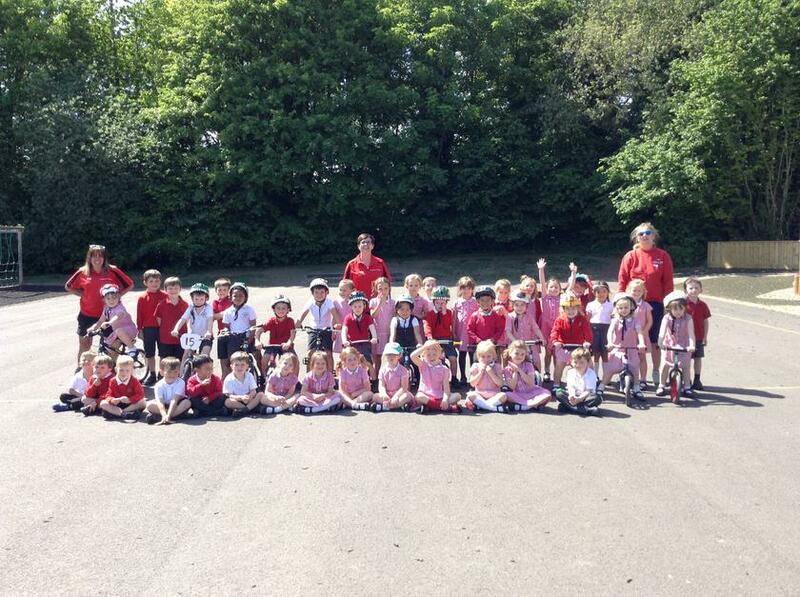 The Year R children have had a wonderful time learning how to ride balance bikes and then pedal bikes with three lovely ladies from Bike ability. 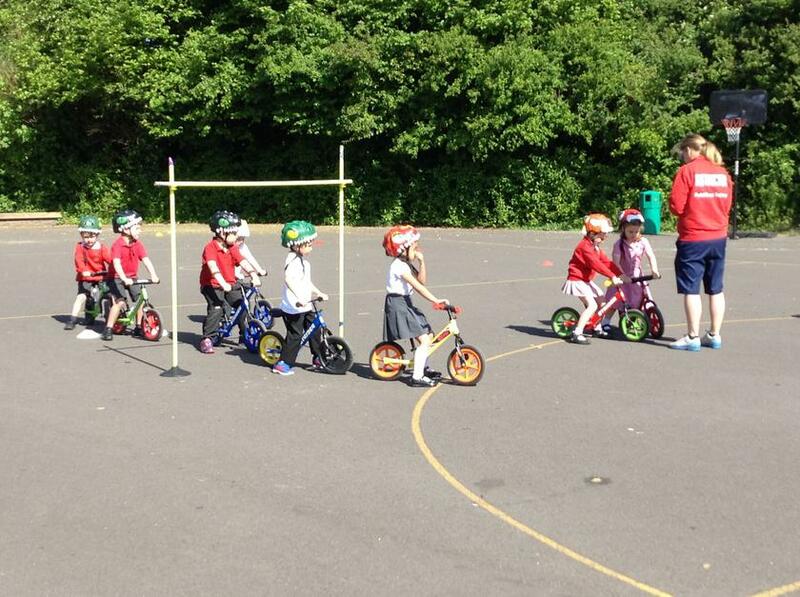 Twenty eight children out of forty-three children managed to ride a pedal bike unassisted. We felt very proud of their achievements! 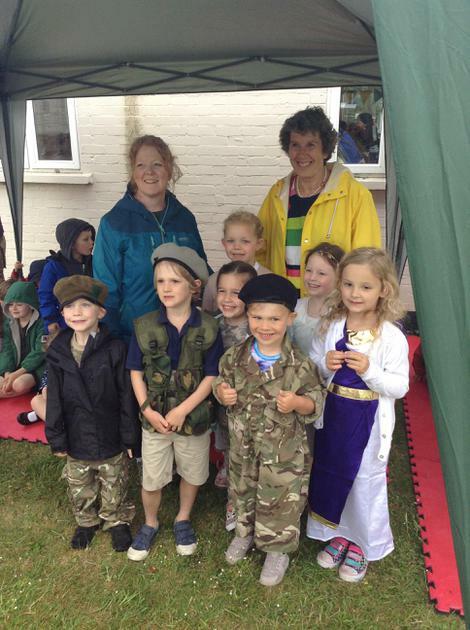 We would like to add that the ladies commented on how well the children persevered and how well behaved they all were. 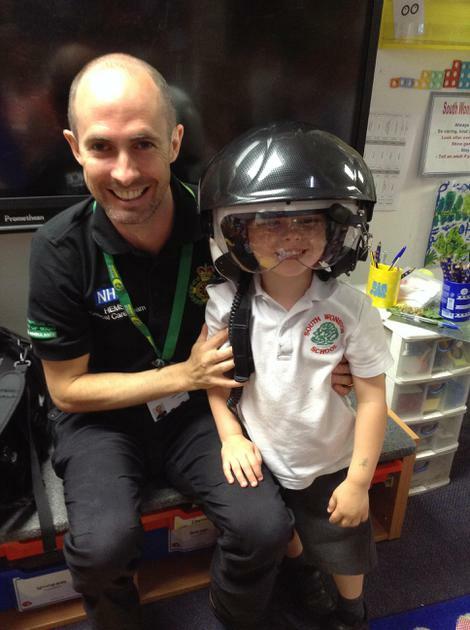 On Tuesday we had an informative visit from Mr Duncan, he came to tell us all about his job as an air ambulance doctor. 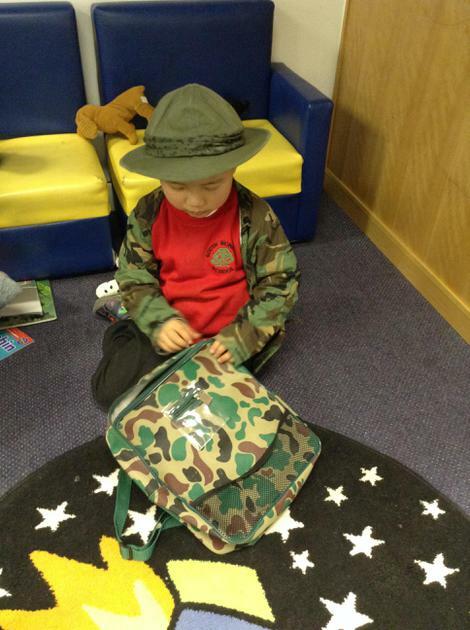 He told us all about the different jobs he has to carry out and showed us his uniform. 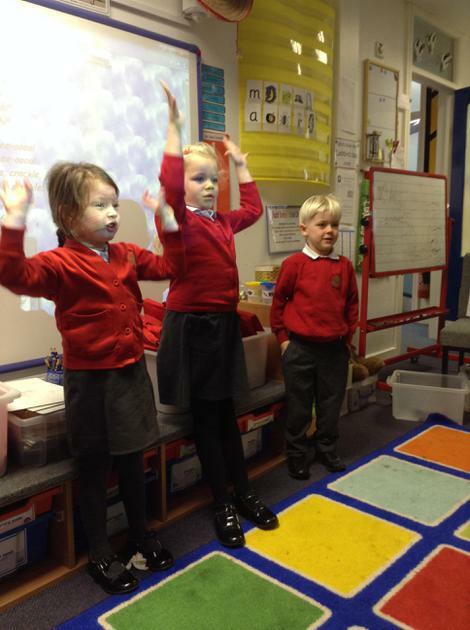 This week Year 1 have been practising for their year group assembly. 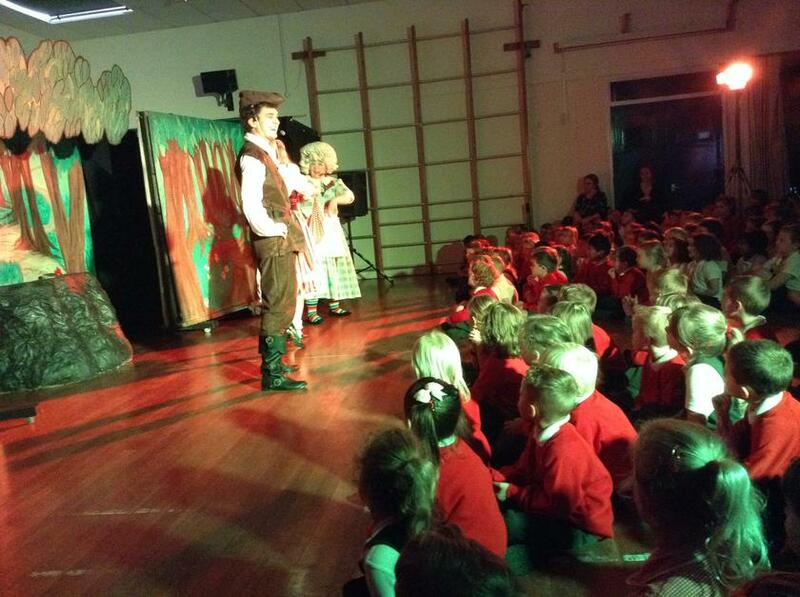 We are so impressed with the way the children have learnt their lines so quickly and know all the words to the songs. In maths we have been continuing to work on our multiplication skills and creating jottings, in the form of arrays to show our working out. 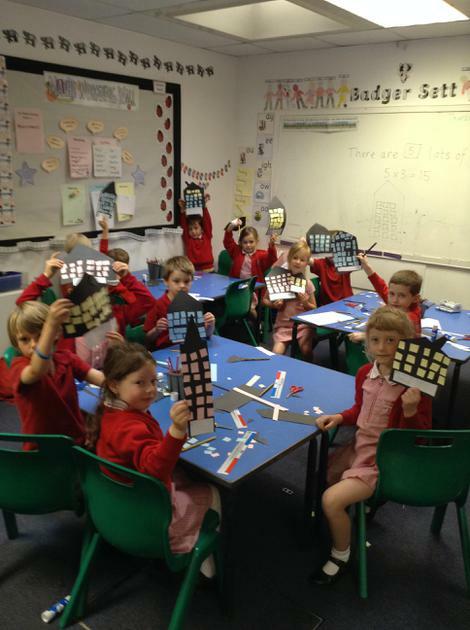 We have even created an array city! In English the Badgers have been writing character descriptions of Florence Nightingale and Nurse Clementine. 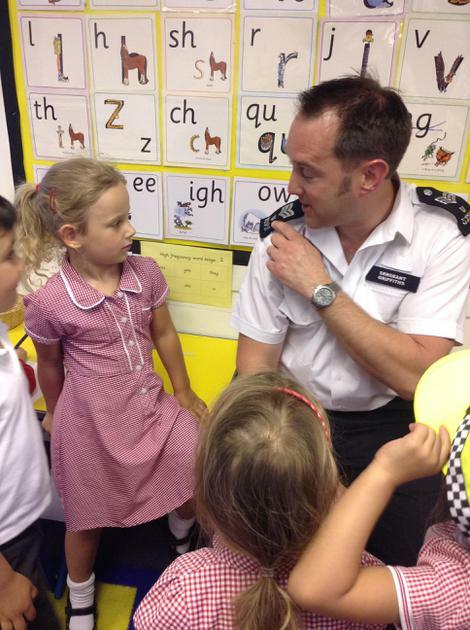 The Year R children have had a visit from Sgt Griffiths who explained his job as a police officer. 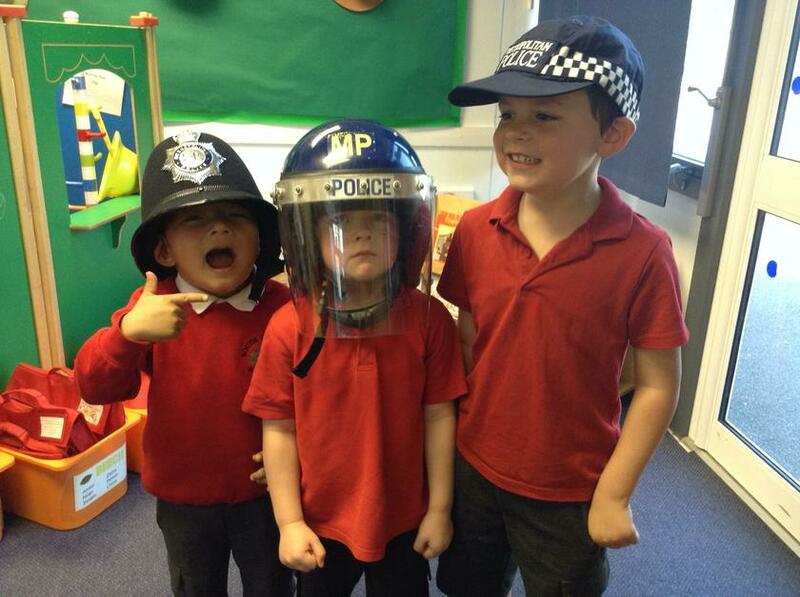 He showed us his uniform and the many hats a police officer has to wear. He told us about how important it is to take notes when a crime happens. This was really handy as during the week something or someone stole and ate Mr Simpson's vegetables from our outdoor area. We used magnifying glasses, tape measures and wrote notes as we investigated the crime scene. 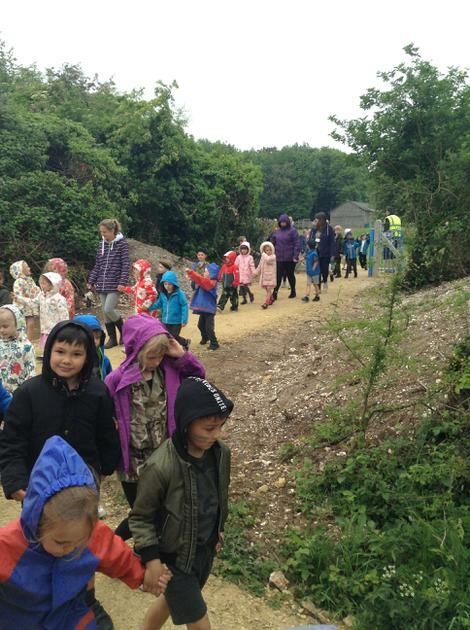 We think it may have been Peter Rabbit as a small blue jacket was left behind! 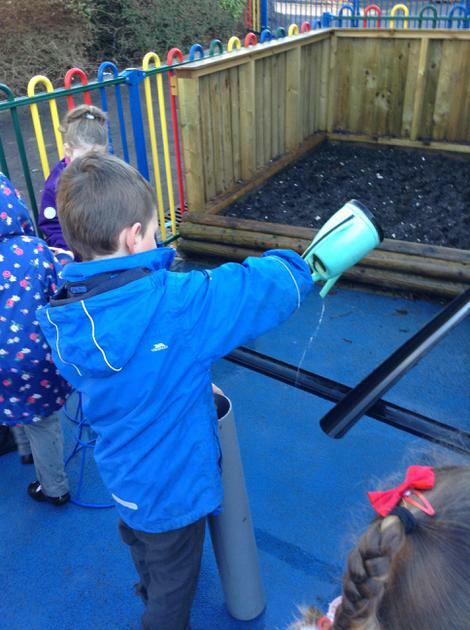 In Year 1 we have planted some beans and we have decided how often we should water them. We have labelled the parts of a plant and talked about the role each part has in order for a plant to grow. In maths we have been learning about multiplication and using the 'X' symbol in our number sentences. In English we have been learning about words in contracted forms. 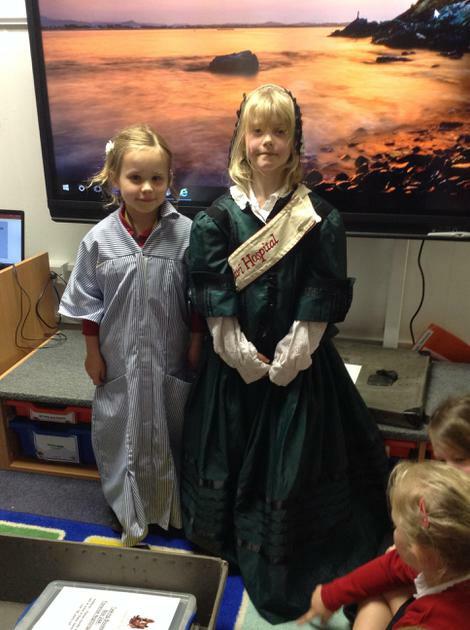 The Year 1 children have enjoyed finding out more about Florence Nightingale. 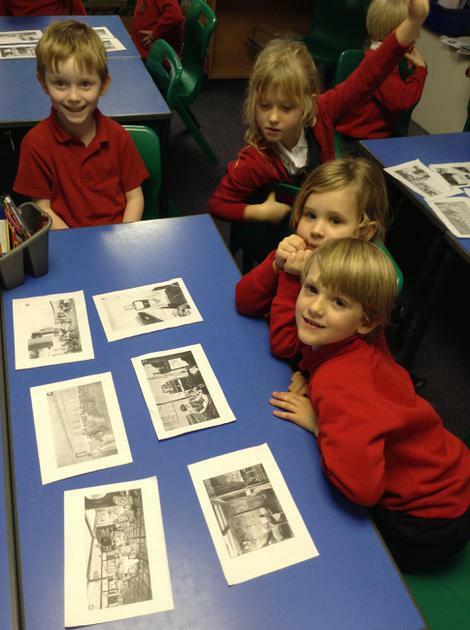 We have discussed her significant life events and had the opportunity to look at artefacts from the time period. 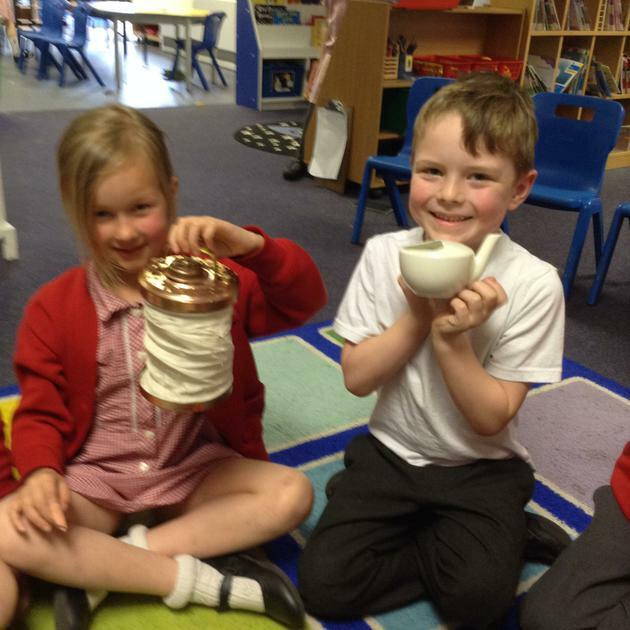 Some of us dressed up as Florence Nightingale and we looked at medicine bottles and lamps from the time and compared these to what we find in hospitals today. In English we have been reading the book, Nurse Clementine by Simon Jones. The children have role-played how to ask questions like a nurse and then moved on to writing these questions using the correct punctuation. 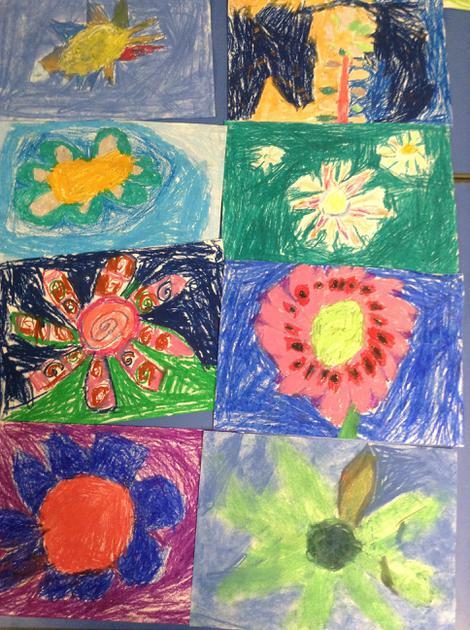 In Art we have looked at the work of Georgia O'Keefe and made our own pieces in response to this. The Year R children have had a busy week. The Ladybirds performed their class assembly and we were all very proud of how well they performed. We also had a special visitor! 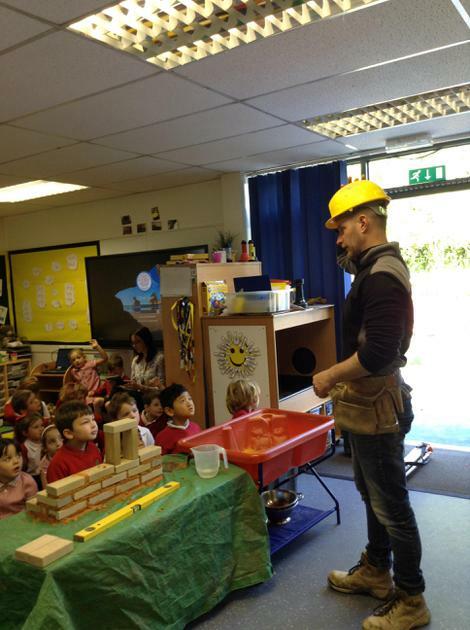 Mr Fairhead came to tell us about his job as a builder. 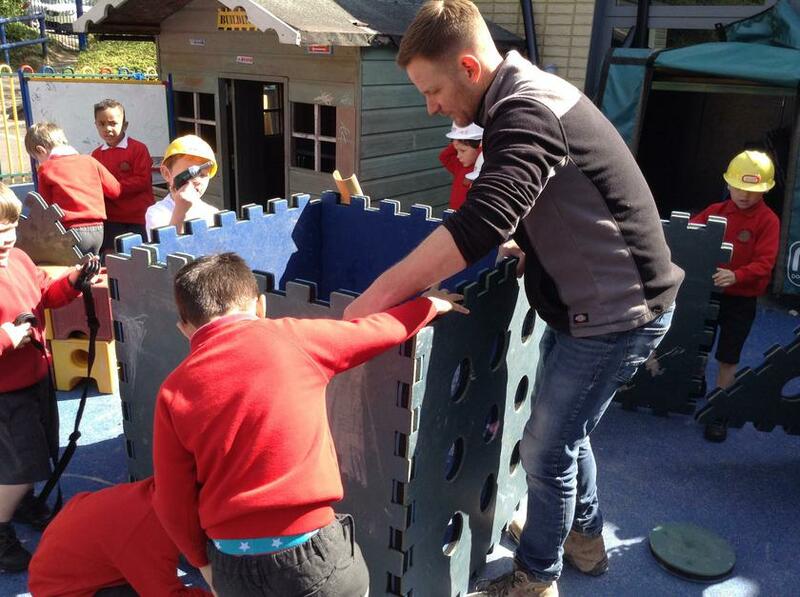 The children were enthralled to watch and learn how concrete is made and how to construct a wall correctly so that it is stable. 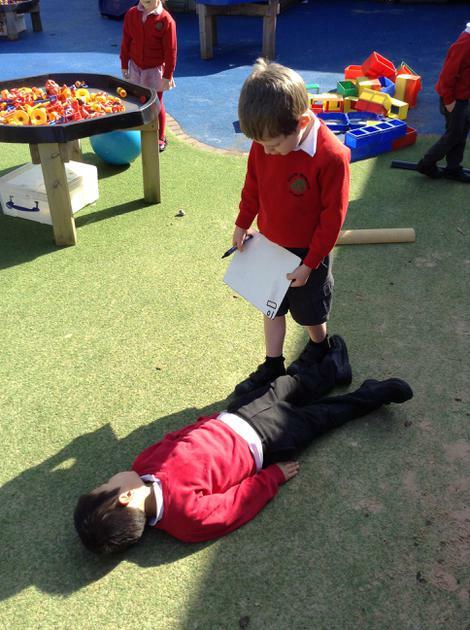 We asked lots of questions and then role-played what we saw. We had lots of fun! The Year R children have starting learning about people who help us and this week we have been discovering about the role of nurses. 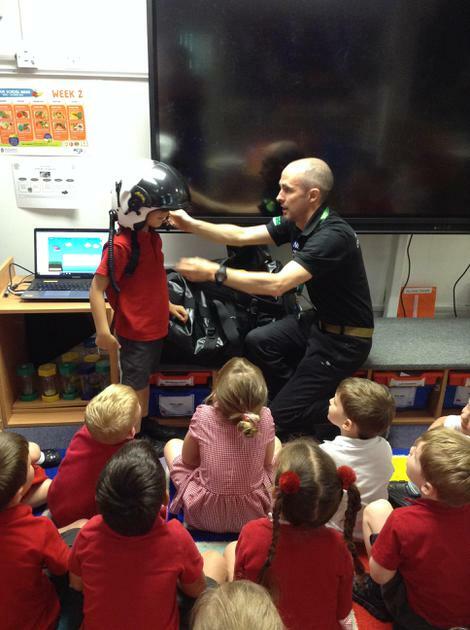 We have looked at our school first aid boxes and learnt about the importance of keeping medicines safe and why plasters and bandages are stored in wrappers. In maths we have created our own hats and have had to find out how to make sure our hats were the right size. We have also been solving subtraction problems and working hard on counting back from 20. 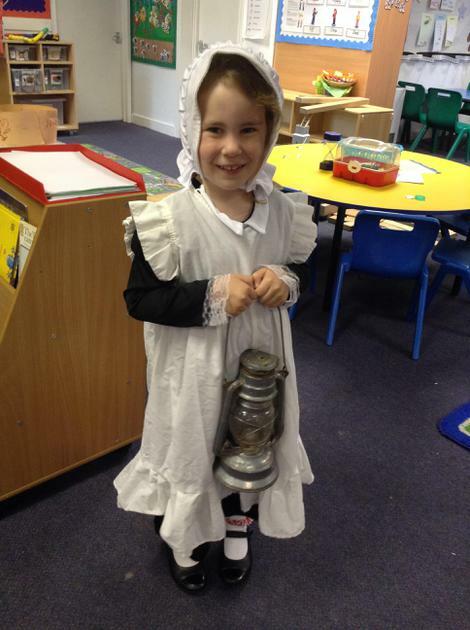 Year 1 have enjoyed discovering about Florence Nightingale this week and had a visit from our very own Florence! They have begun to research about why she was an important person in history and have thought of questions that they would like to find out about her. 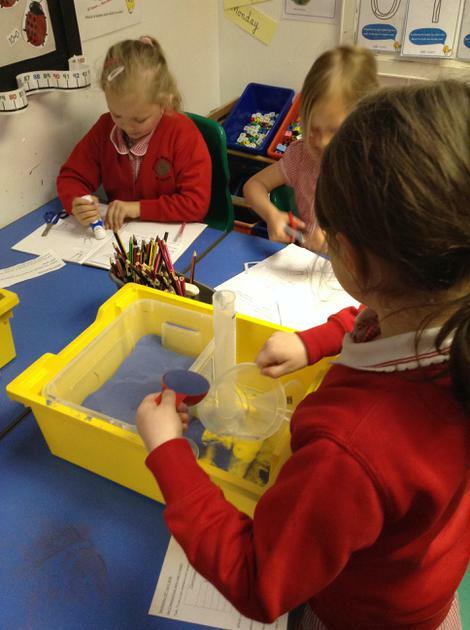 In Maths the Badgers have explored capacity using measures and carried out investigations about what containers hold more or less than a litre of water. We have also been practising and developing our sketching skills and have created some portraits of Florence Nightingale. 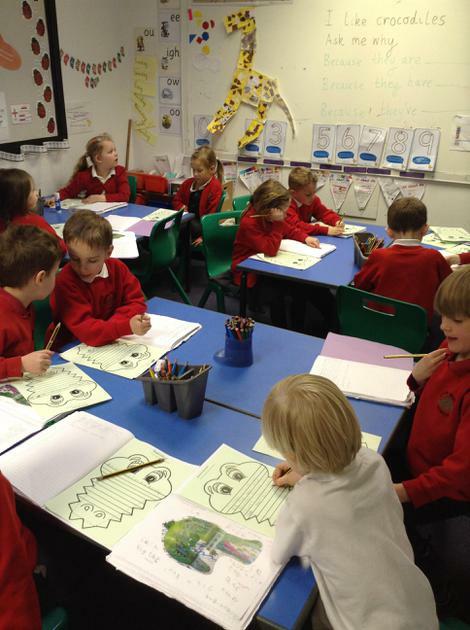 The children have had a busy first week back at school after the Easter holidays. 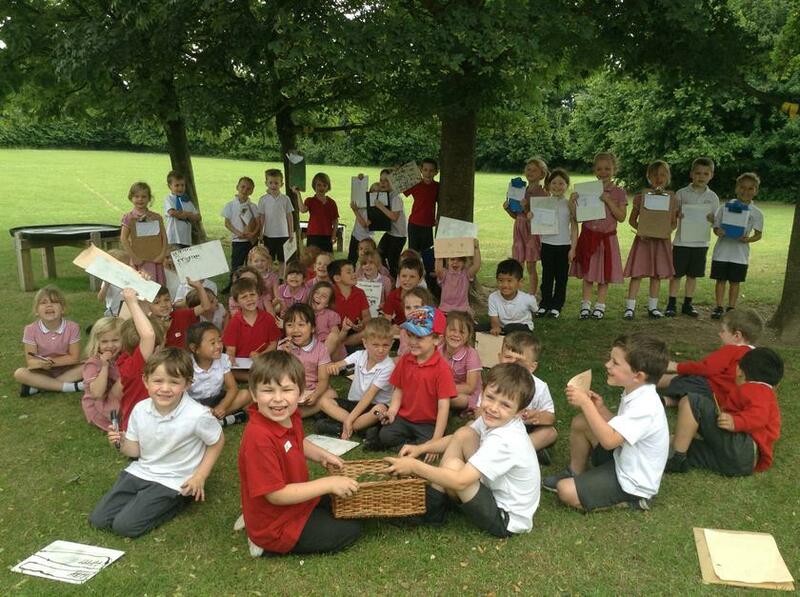 It has been lovely hearing about what the children have got up to and both the Year R and Year 1 children have written some wonderful recounts about their holiday activities. 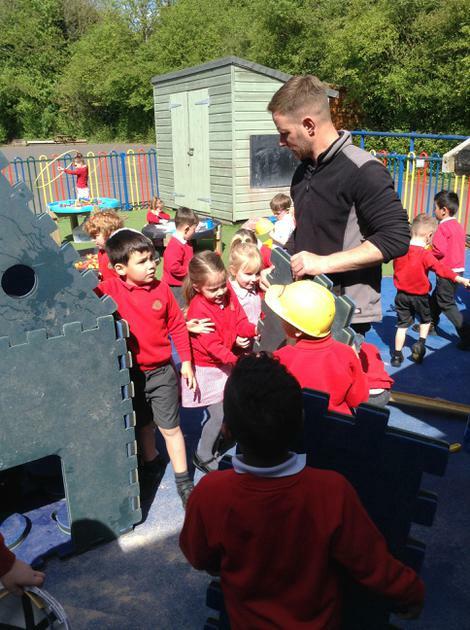 In Year R we have taken advantage of the lovely weather we have been having and carried out lots of activities involving capacity and measurement. 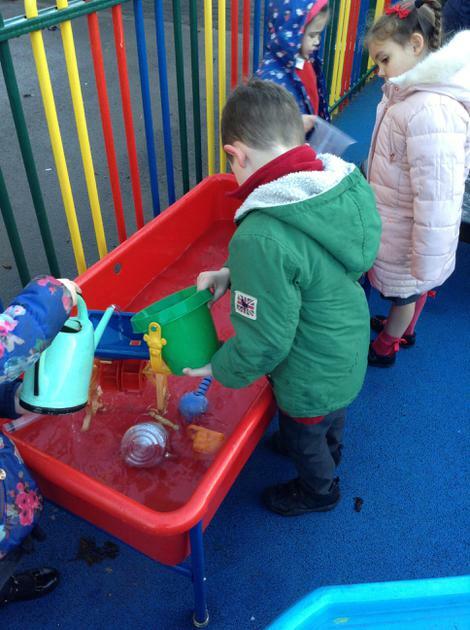 The children had to decide which containers would hold the most water and if the size of the container changed this outcome. 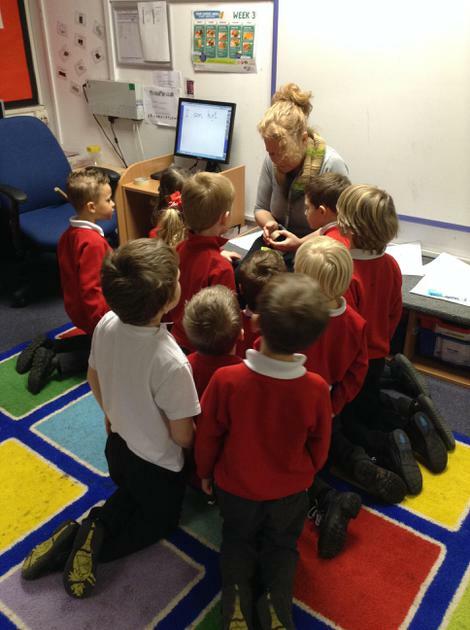 In Year 1 we have been investigating weight and mass. The children have been comparing different weights and using standard measures to weigh their items. We have enjoyed creating jungle scenes in art using tissue paper collage and creating an animal/bird to go into our scene. The Year R children have been making and writing postcards for Sunny our classroom meerkat. Sunny the meerkat has sent us many postcards and we decided to write back to him to tell him all that we have learnt. 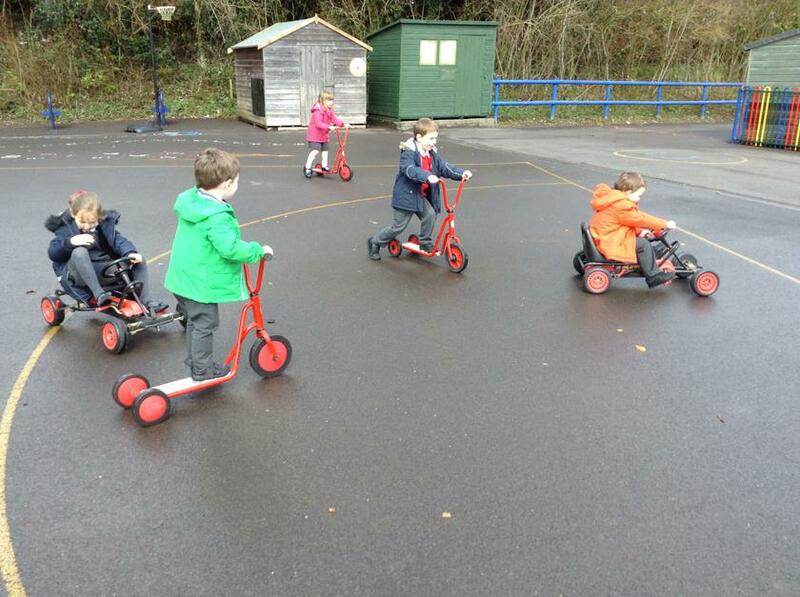 On Thursday we enjoyed having a go on the scooters and go-karts. 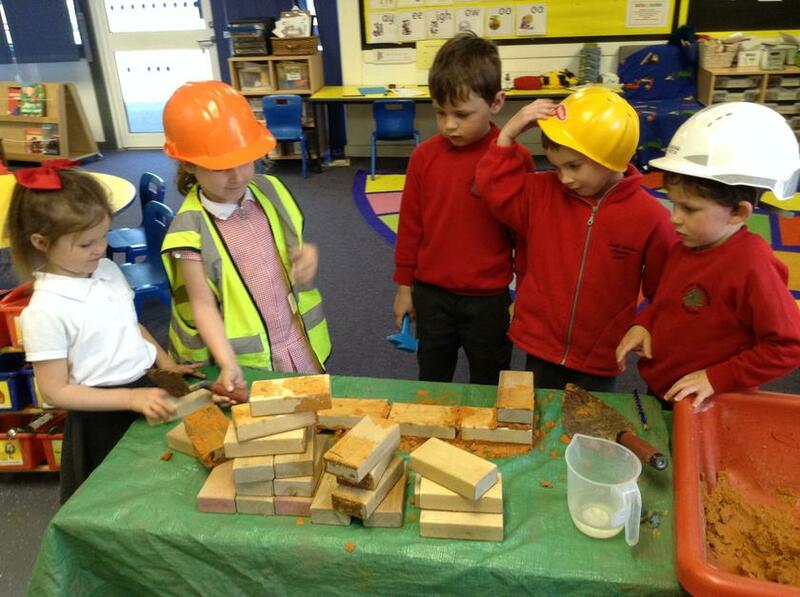 We were really impressed with the team work skills that the children displayed. We have also had fun designing and creating our Easter cards. We hope you like them! 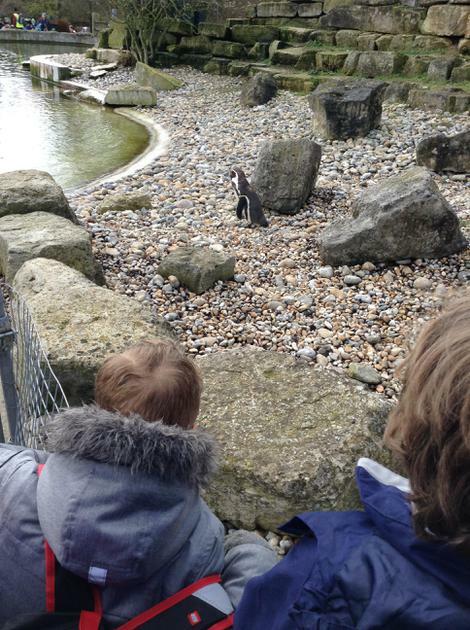 The Year 1 children loved their trip to Marwell Zoo, despite the rain they enjoyed exploring the animal habitats and reading the individual fact files about all the animals that they had seen. It was exciting to see the sloth in the new tropical rainforest! 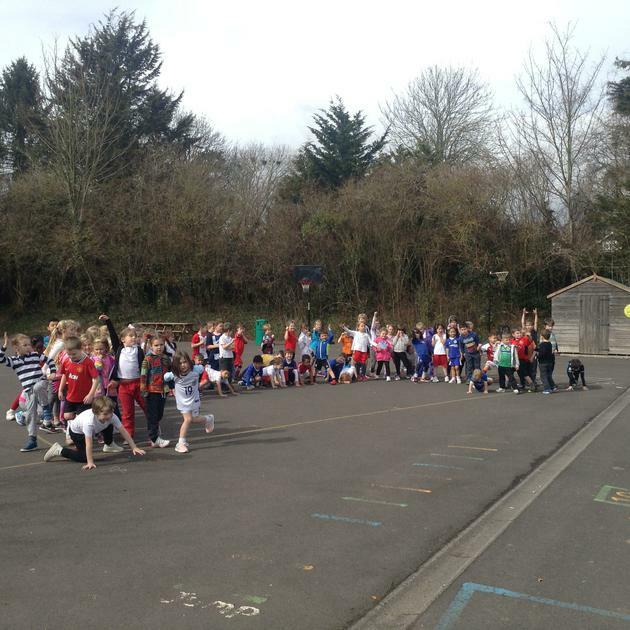 The children have thoroughly enjoyed taking part in a variety of activities for Sports Relief. We have been discovering how many hops, jumps, skips and laps we can undertake in a minute and then recording and comparing our results. 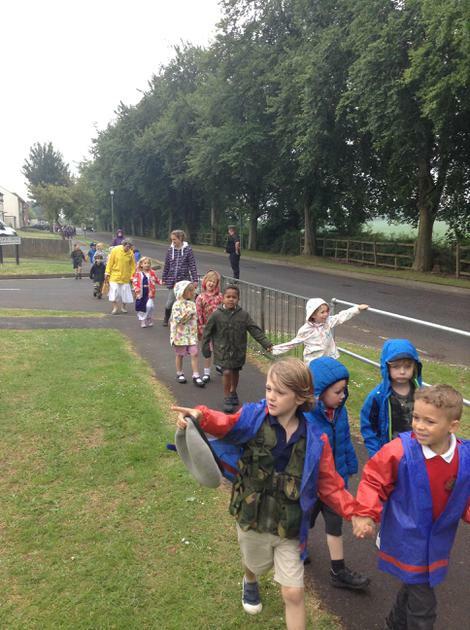 We have also had a lovely time taking part in our Golden Mile with Hedgehog class. Well done to all the children for raising money for such a good cause. The Year R children have been completing many number based tasks this week and we are very impressed with how much knowledge they have acquired. 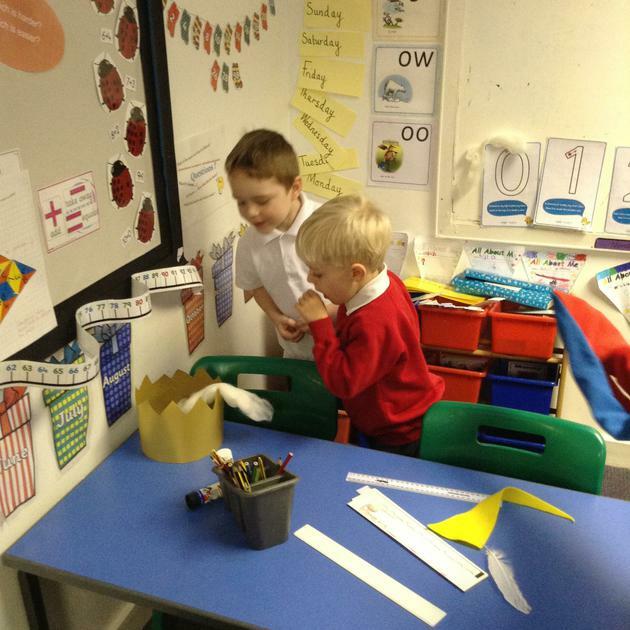 They have been ordering numbers, writing numbers and counting a variety of objects in the classroom. 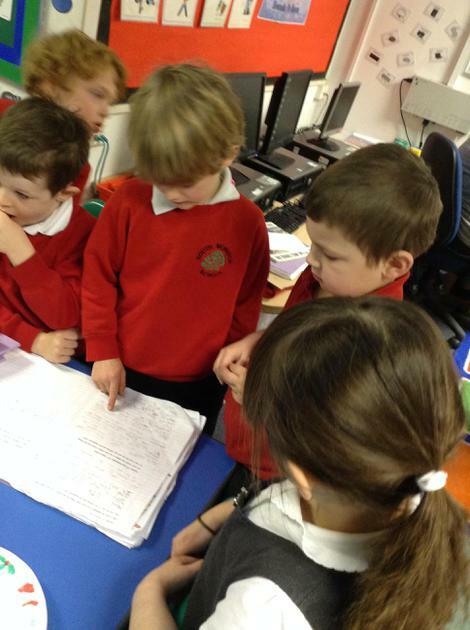 We have also been discussing things we have achieved since we have been at school. 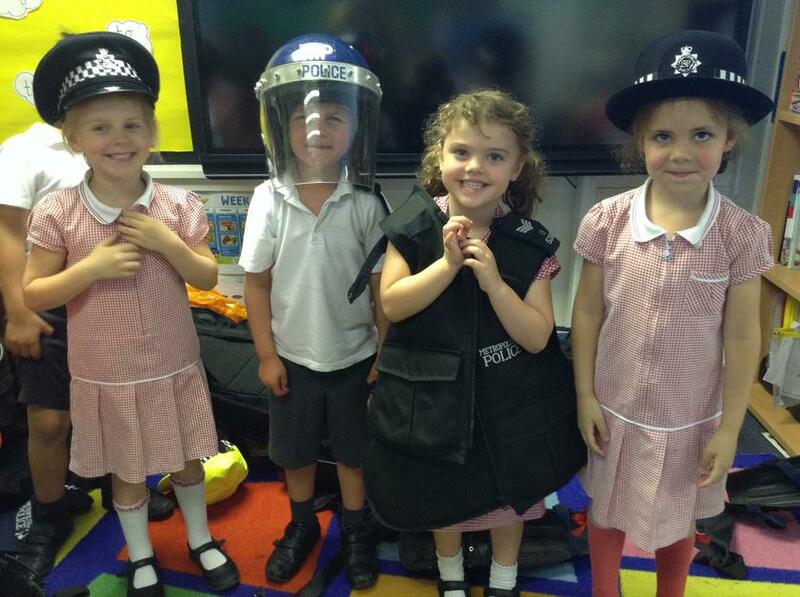 The children all thought of something they can do now that they couldn't do when they started school. 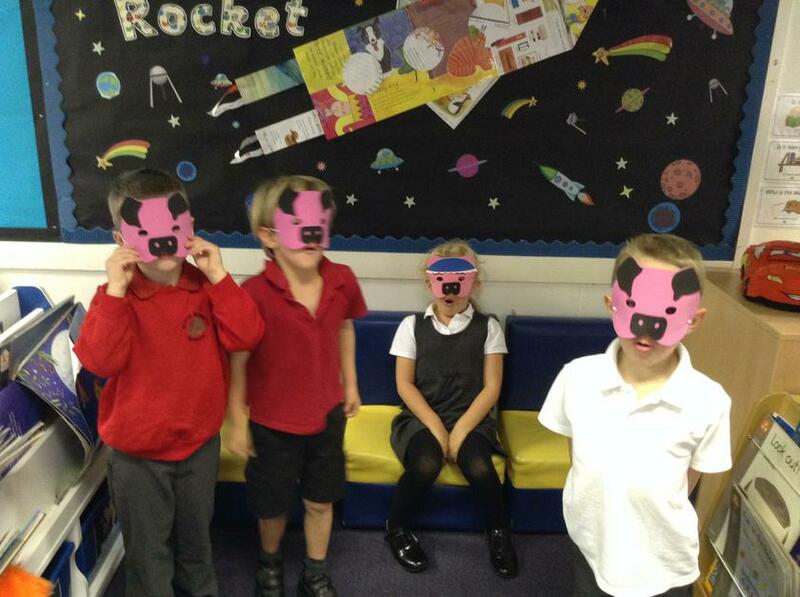 The week finished with the making of some lovely animal masks. Well done Ladybirds and Bumblebees! 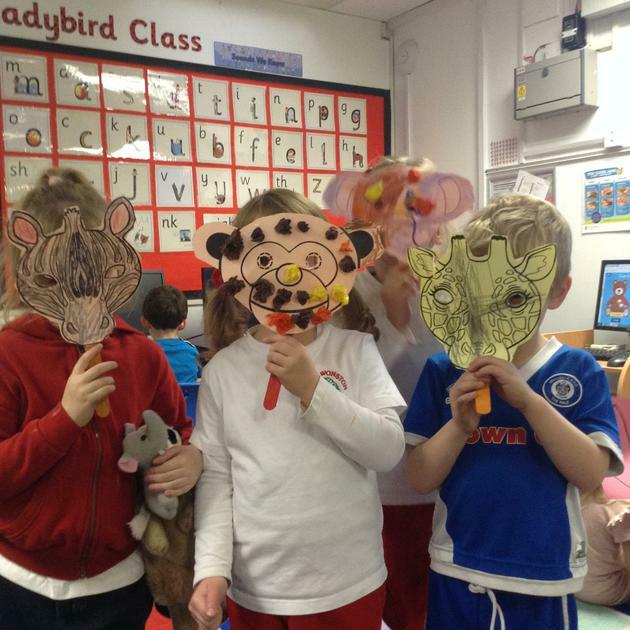 The Year 1 Badgers have created some wonderful animal riddles this week and have included adjectives to make them really interesting. 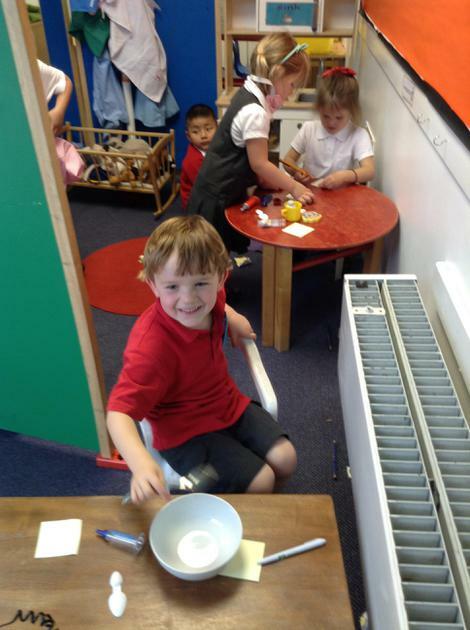 In Maths we have been using rulers and non-standard measures to measure a variety of objects in our classroom. 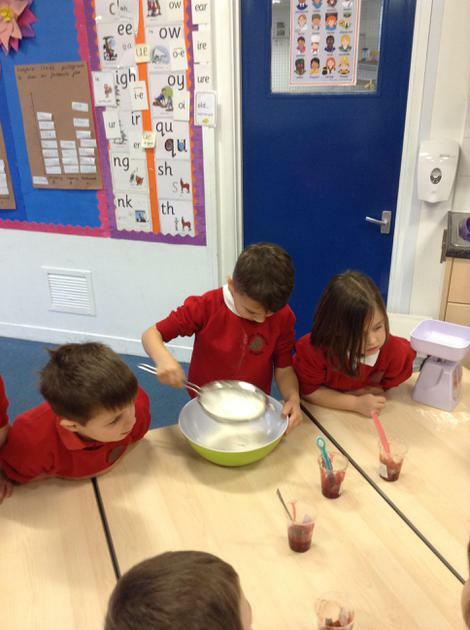 We have had a very exciting science week and we have had the opportunity to carry out many practical experiments. We worked in our house groups and we made slime, paper helicopters and bubble snakes. We even watched a volcano erupting in the class! 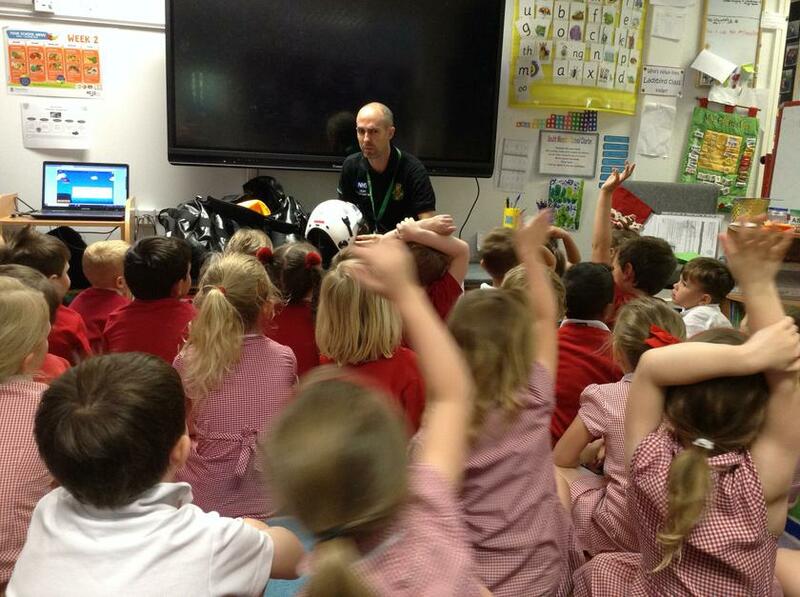 We have also had many interesting visitors come to school to talk about science in their workplaces. 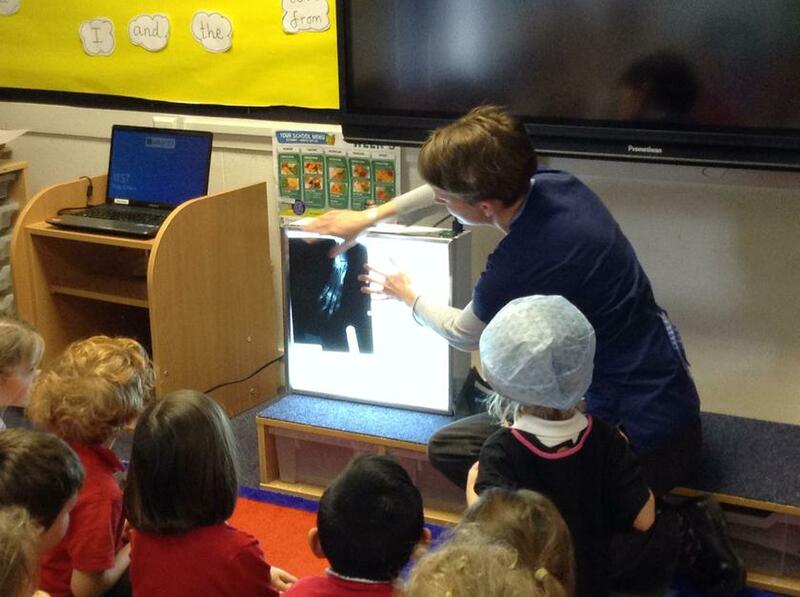 Year 1 Badgers have enjoyed a visit from nurses who came with a big skeleton to talk about bones. We hope the children share all this new knowledge with you! 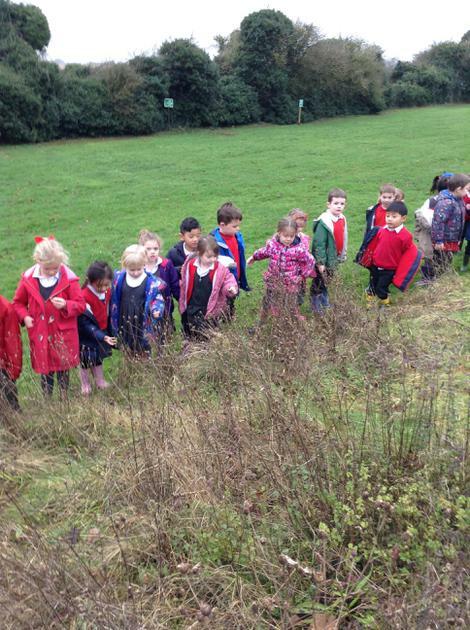 This week the Year 1 children have had the chance to look for animal habitats in our school grounds. 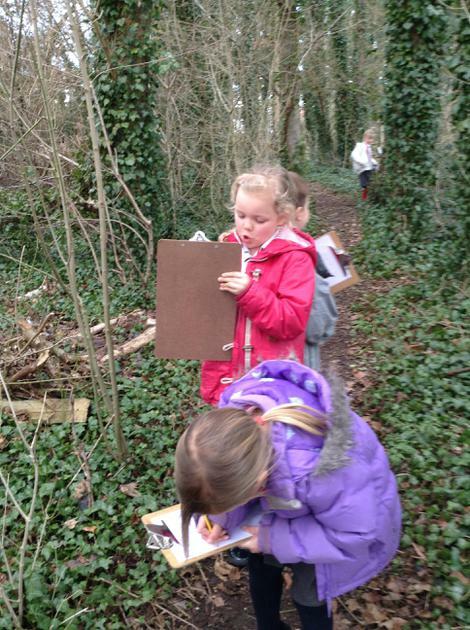 We took our clipboards and made tally charts detailing our discoveries. 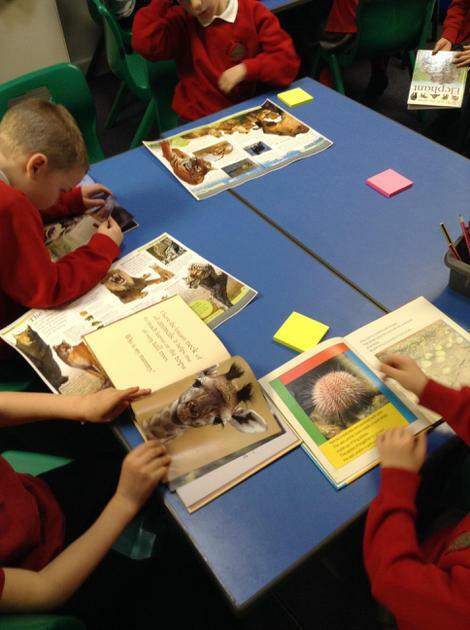 In English the children have been exploring non-fiction texts and the Internet to find facts about a chosen animal that they are going to create a fact file about. In maths we have been solving problems using 10 more and 10 less than a given number. 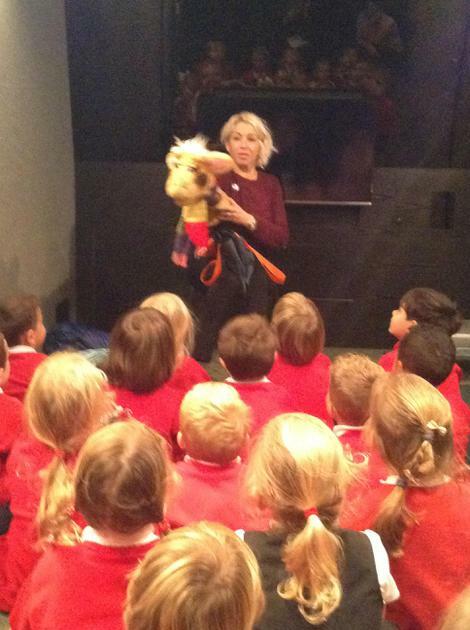 We also had a lovely visit from Mrs Walters. 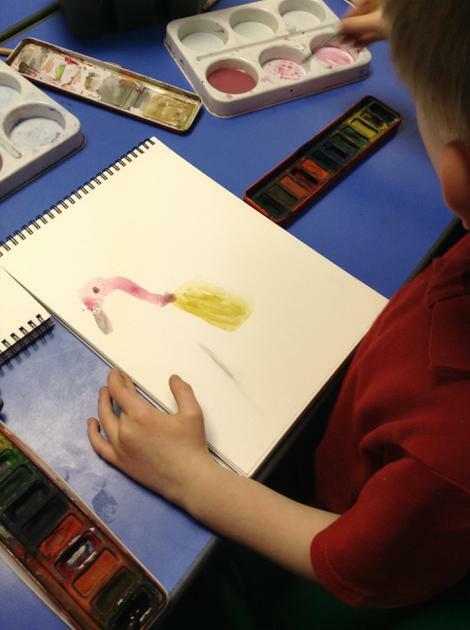 Mrs Walters is an artist who came in to show us how to paint animals using watercolours. We love the finished results! Thank you Mrs Walters! In Year R we have been writing labels! We have labelled our clothes that we need to wear when it is cold and we have been applying this skill during our other learning activities. 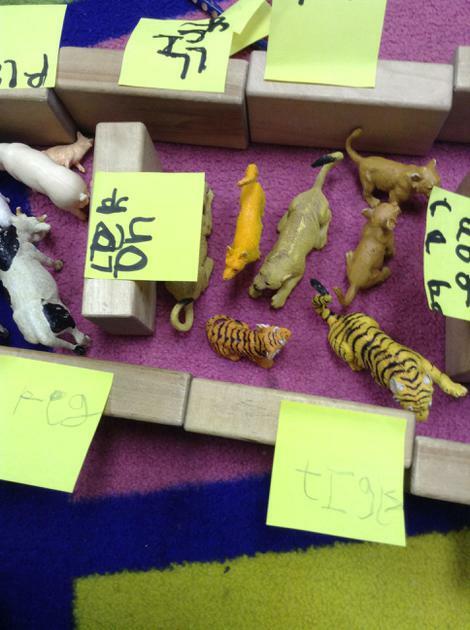 A group of children created a zoo enclosure and decided to label their creation. In Maths we have been practising our addition skills using Numicon. 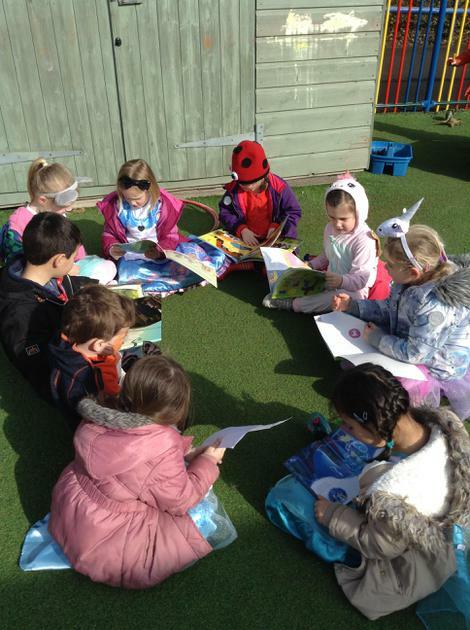 We loved our World Book Day celebrations too! What a busy week! Thursday 1st March: Snow Day! We all hope you have fun in the snow today. We have thought of some activities that you could do while school is closed. Have a wonderful time and keep warm! - Make different sized animals in the snow. - Practice writing your name in the snow. 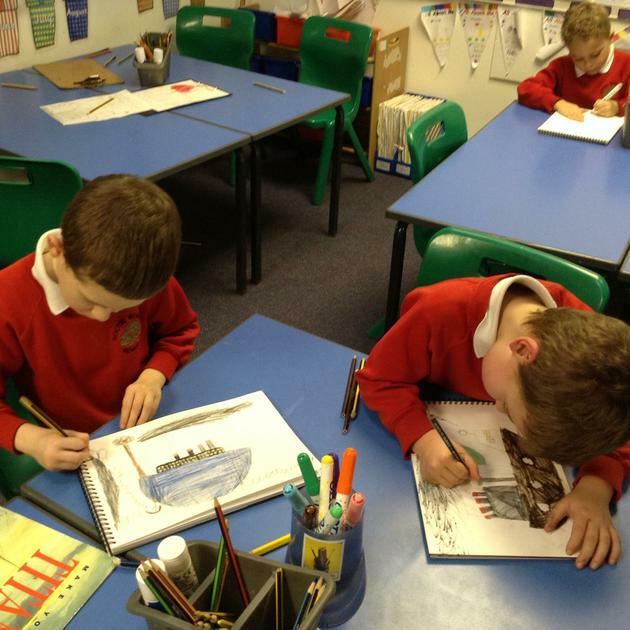 - Draw a snowy picture and write a sentence to describe what you can see. - Talk about what the snow looks and feels like with an adult. - Pour lukewarm water onto the snow and see what happens. 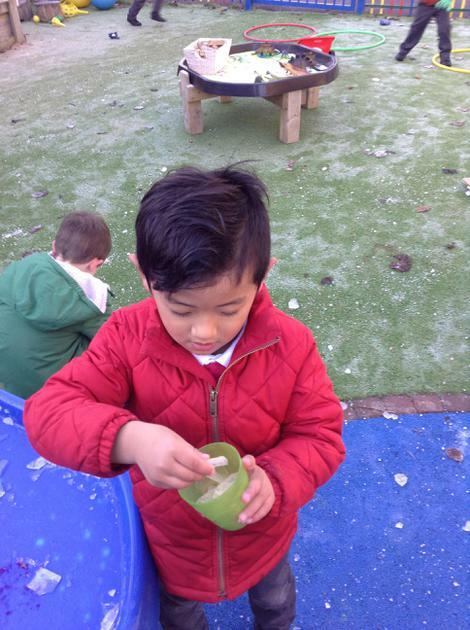 - Blow bubbles in a bowl, in the snow and watch them freeze. - Build a snowman and then paint him! - Take a picture of yourself having fun in the snow to share at school! In Year R we have begun our new topic of 'Amazing Animals.' The children met Sunny the Meerkat who brought us some postcards with questions and tasks for us to answer and solve. The children have completed subtraction problems using objects and then recorded their findings. 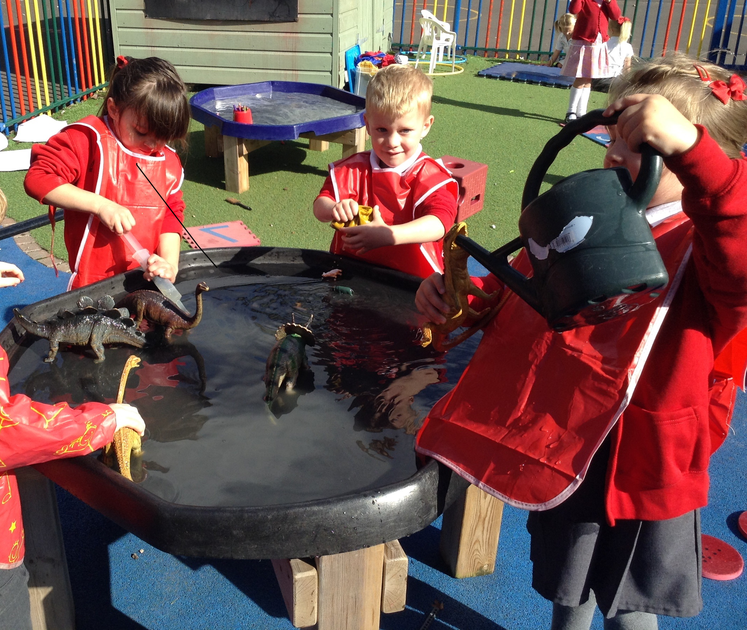 Furthermore, the children have begun exploring the characteristics of a variety of jungle animals and have thoroughly enjoyed looking for animals in our new explorer role-play area. 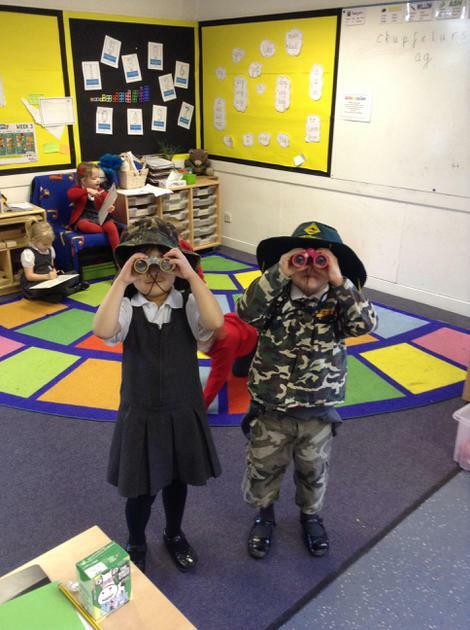 The children have used information books to check what animals they have located through their binoculars. In Year 1 we have begun our work on poetry. We started by reading and re-enacting a poem about giraffes and then we used the structure of the poem to compose our own, based on a crocodile. The children have worked hard on including rhyming parts to their poems and have worked in pairs to create these. We are all really pleased with our final poems. 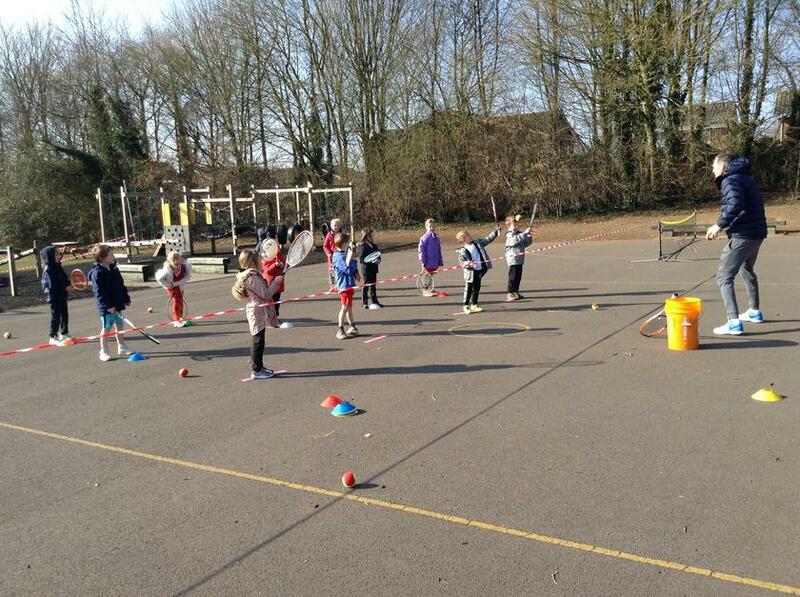 This morning the Year 1 children took part in a Tennis session. Our instructor taught us many different skills which we enjoyed practising. This week we concluded our topic about the Titanic. 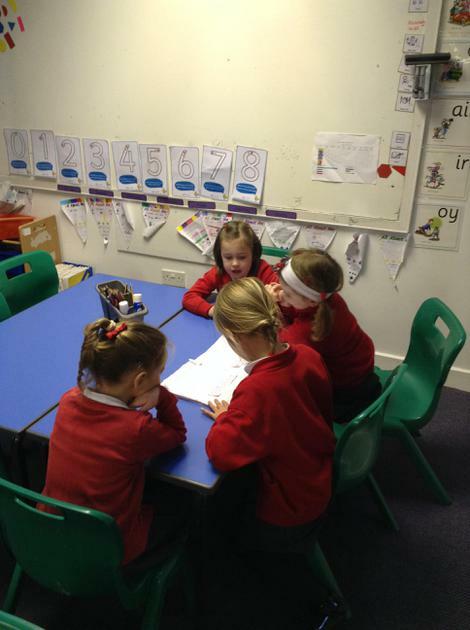 The children enjoyed sharing their home learning books. Everyone had spent time with their parents creating wonderful pieces of work. We were very impressed. The Badgers also applied their knowledge of suffixes when they created fictional diaries about their time on the Titanic. 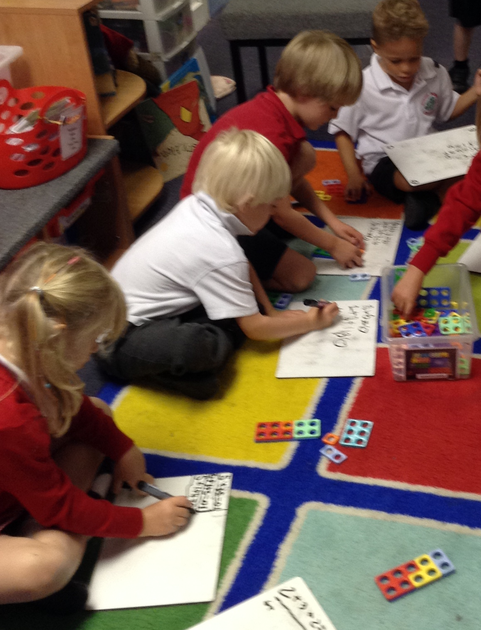 The children have also been partitioning numbers using ten frames and dienes apparatus. This week year R have been focused on applying their phonic knowledge to write simple short stories with a water theme.We have had a range of stories with characters such as unicorns, mermaids , whales and even tigers! 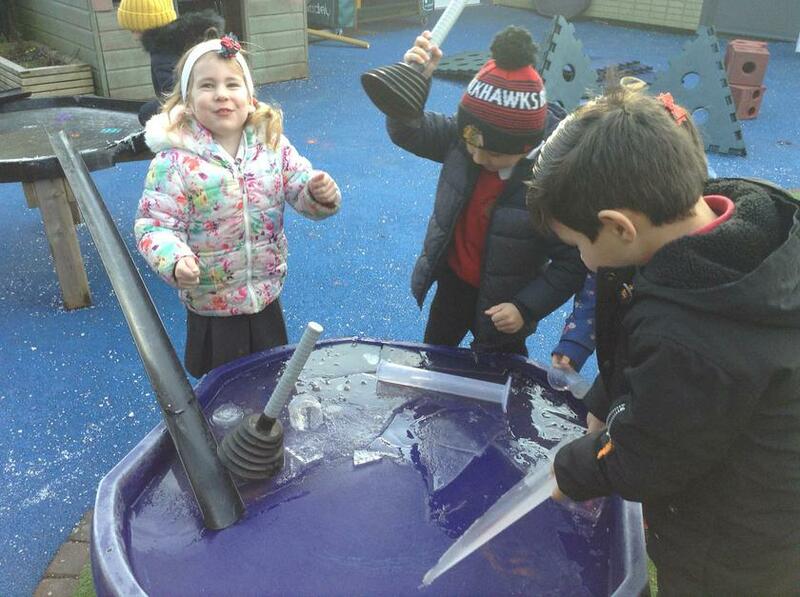 We continued to explore water and ice. 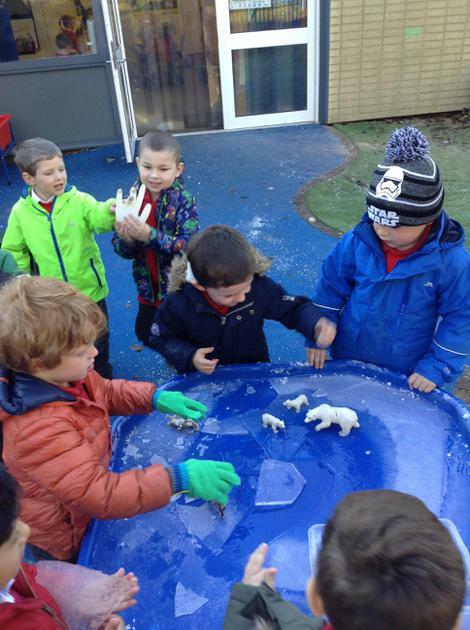 The children were challenged to break the ice into different 2d shapes in the builders trays . They used a range of tools and didn't give up , despite cold hands! They managed to create triangles, squares and rectangles but circles were a bit tricky! 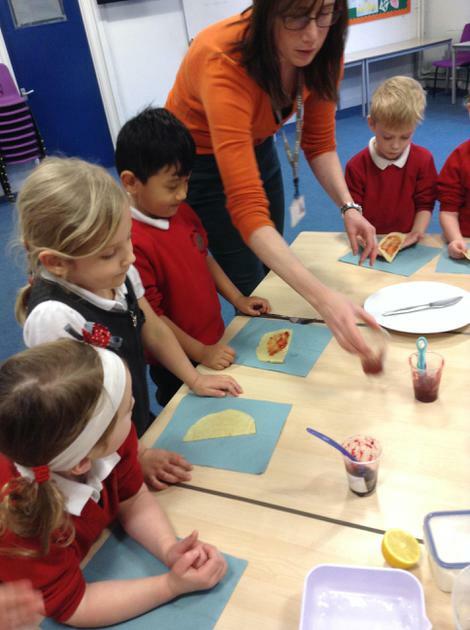 The Year R children have been making pancakes this week and they had to decide on their favourite jam topping. After tasting their creations we created class pictograms and we found out that our favourite jam to have with our pancakes is blackcurrant jam. 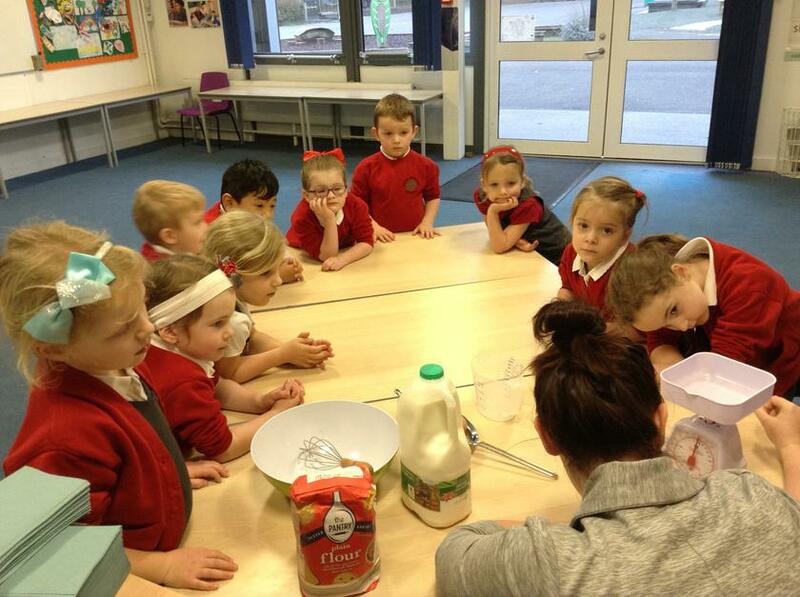 The children went on to write about how to make pancakes by using and applying their phonic knowledge. 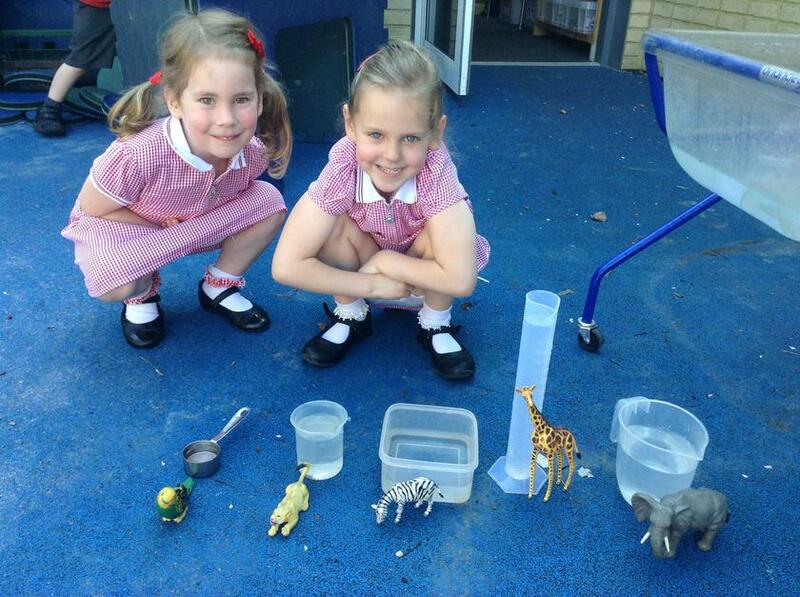 We have also been exploring capacity and thinking carefully about whether the width and length of a container affects the amount of water that it can contain. We went on to order two items by volume while using the correct mathematical vocabulary to describe our choices. 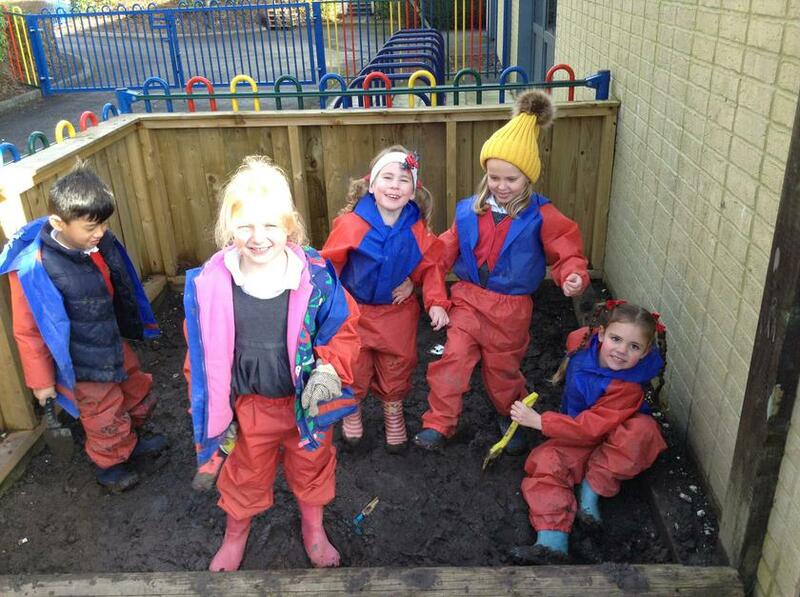 The Year R children have thoroughly enjoyed learning in our digging pit this week. 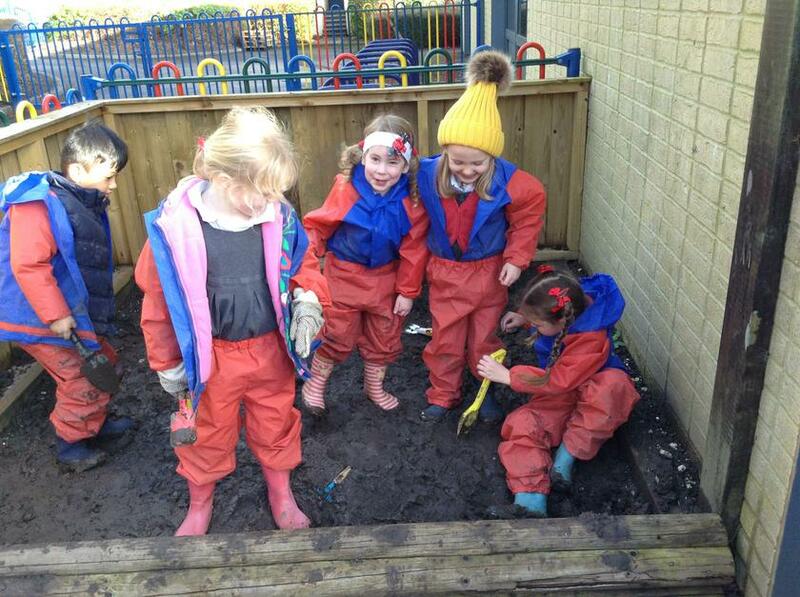 They have been thinking of different words to describe the mud and even singing mud songs! 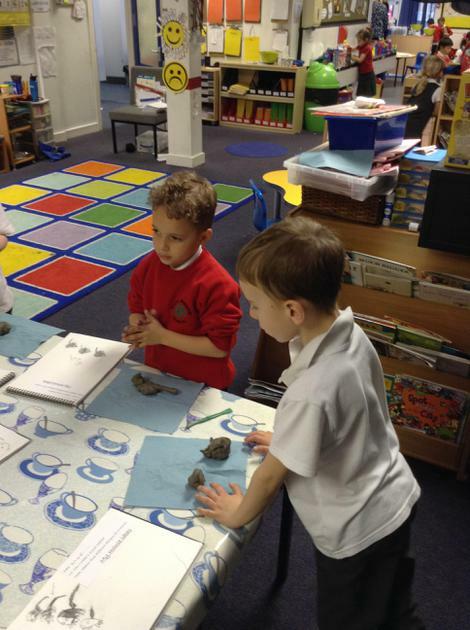 We have discussed how to use mud safely and what happens to mud when we add water. 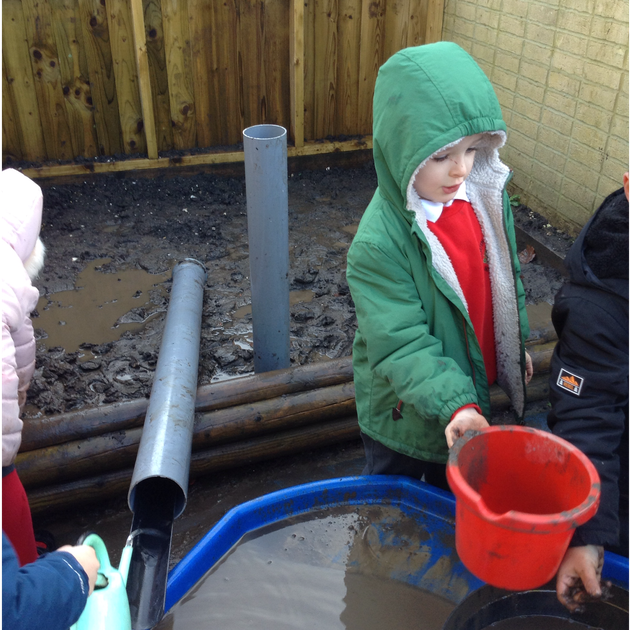 The children have been using the mud to create concrete and discovered that the right consistency of mud and water was needed to make perfect concrete! 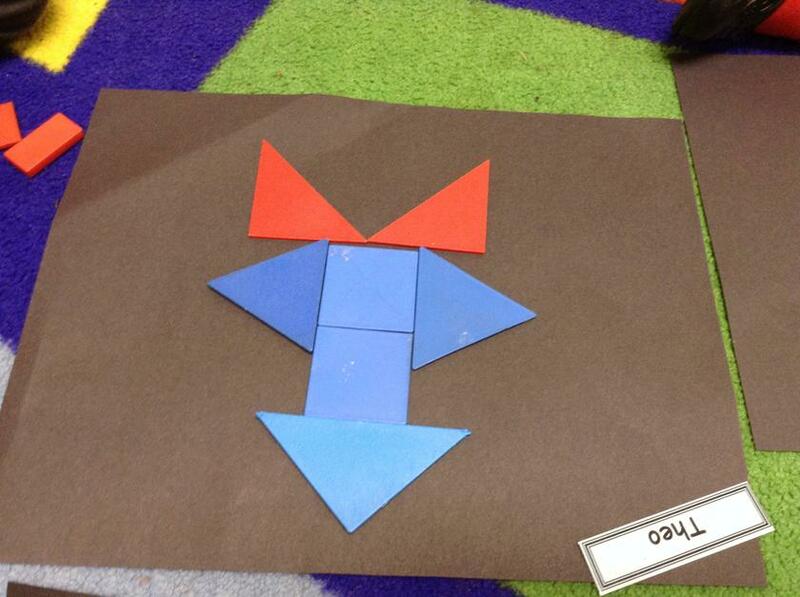 Once this was done the children used this mixture to create models using the 3d shapes. 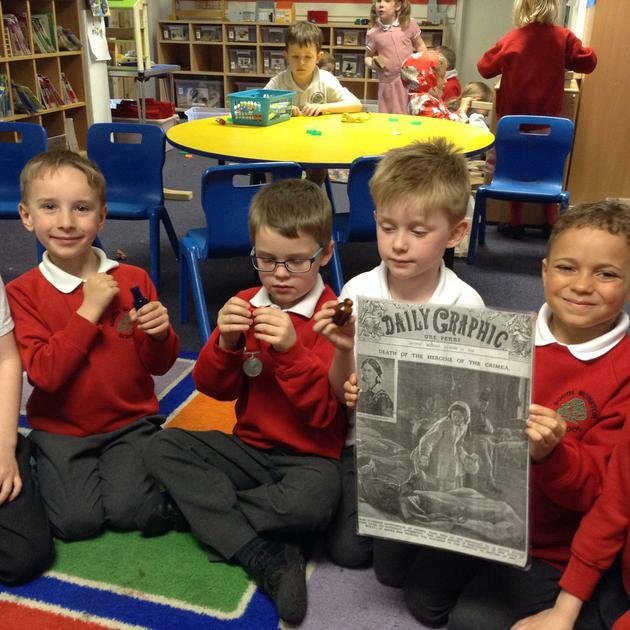 The Year 1 Badgers have been focusing their learning around Samson's Titanic Journey and writing about their story predictions based on the front cover. 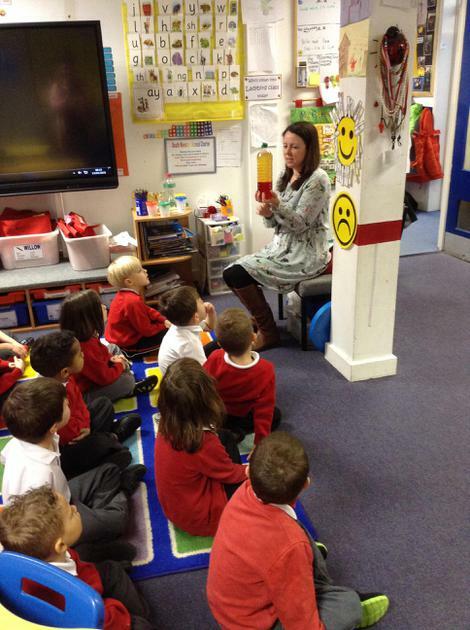 We then read the story to see if our ideas were correct. 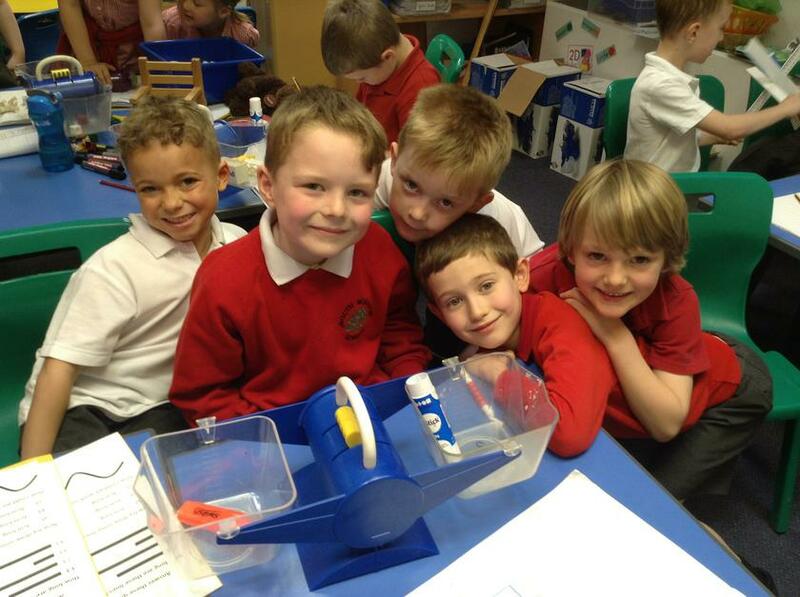 In Maths we undertook an investigation on lifeboats and used our knowledge of number bonds to complete the task. During topic we discovered what life was like for 1st, 2nd and 3rd class passengers on board the Titanic and wrote a diary entry for a passenger. 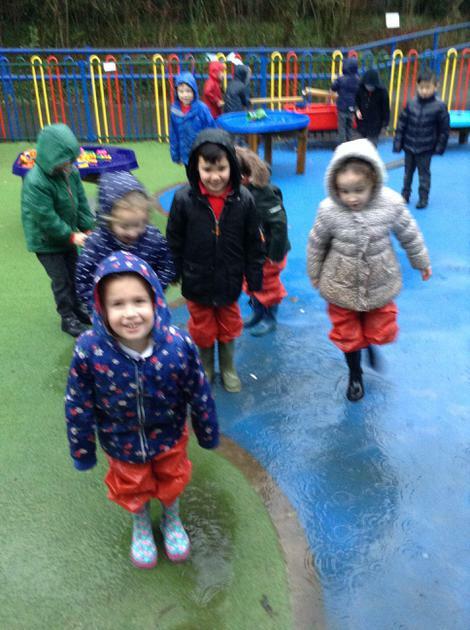 This week the Year R children have been investigating water further and have had a chance to go and explore the rain in our outside area. 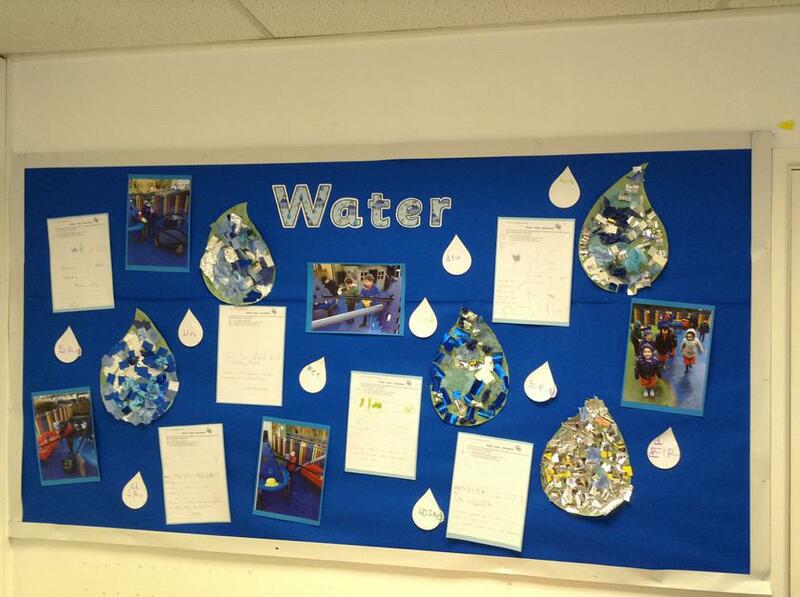 They have thought of some wonderful adjectives to describe water and we have used these to create a water display. We have had the Year 1 class assembly this week and the Year 1 Badgers performed wonderfully, we are all so proud of them! Upon returning from our assembly the Year 1 children had the opportunity to share their own 'Where the Wild Things,' stories with Year R. The Year R children loved listening to them! In Maths they have been continuing using a number line to perform addition calculations involving missing numbers and in Art we have been sketching and colouring our own representations of the Titanic. We have had a busy week and a half back at school and have settled back into our school routines quickly. 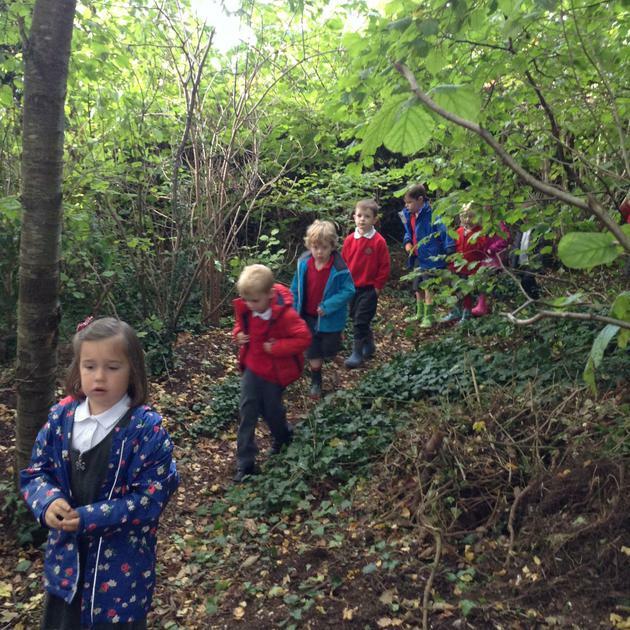 In Year R and 1 we enjoyed using our senses to find out about the signs of Winter; we went on a Winter walk and discussed the changes that have occurred since the Autumn. 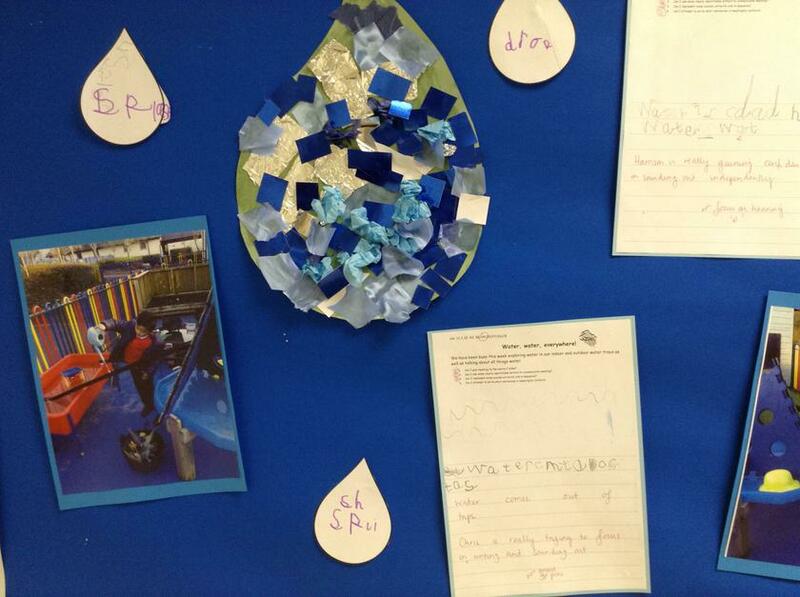 In Year R we have been learning and discovering about the properties of water. 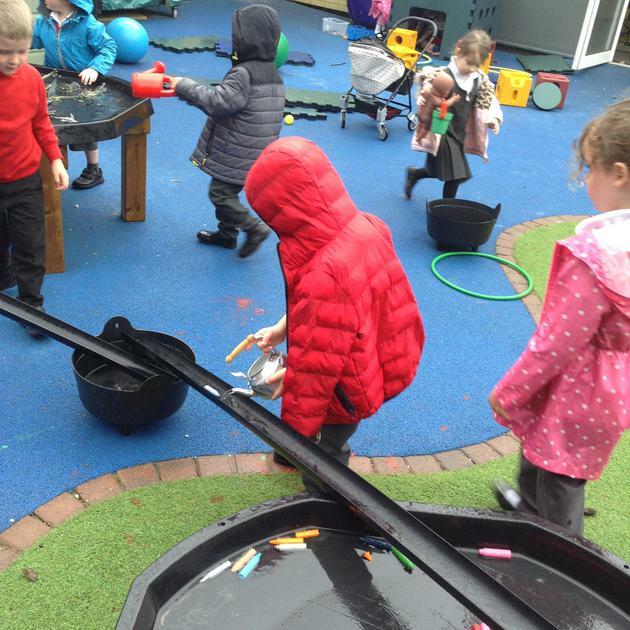 In our outside area we have been constructing complex pathways for water to travel through and solving problems together in small groups. We have then used this learning to write about all the things water can do while working hard on applying our phonic skills. In Year 1 the Badgers have been solving worded addition problems using a number line and using their knowledge of number bonds to find different ways to make 20. 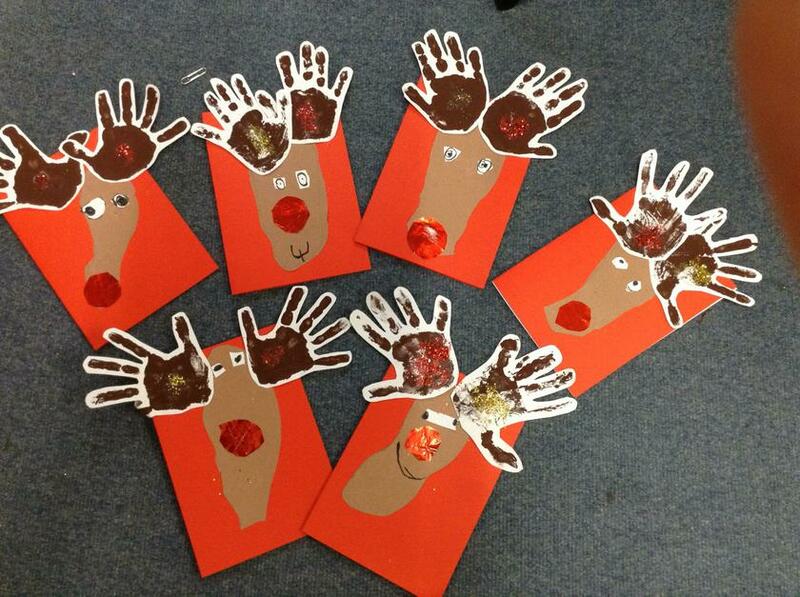 We have had a very busy few weeks and have loved all the Christmas activities that we have been involved in. The children performed wonderfully in our Christmas Play of 'Whoops a Daisy Angel' and we were so proud of them all.The children have been exploring the concept of weight and comparing the weight of different parcels that have been wrapped in preparation for Christmas. 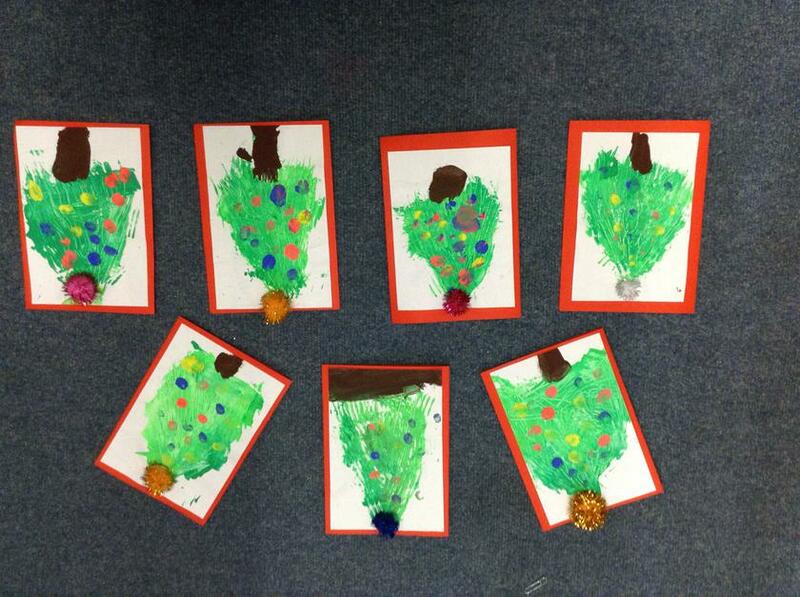 The children have thoroughly enjoyed creating their Christmas cards and have been pleased with the final results. We hope you enjoy receiving them this week! 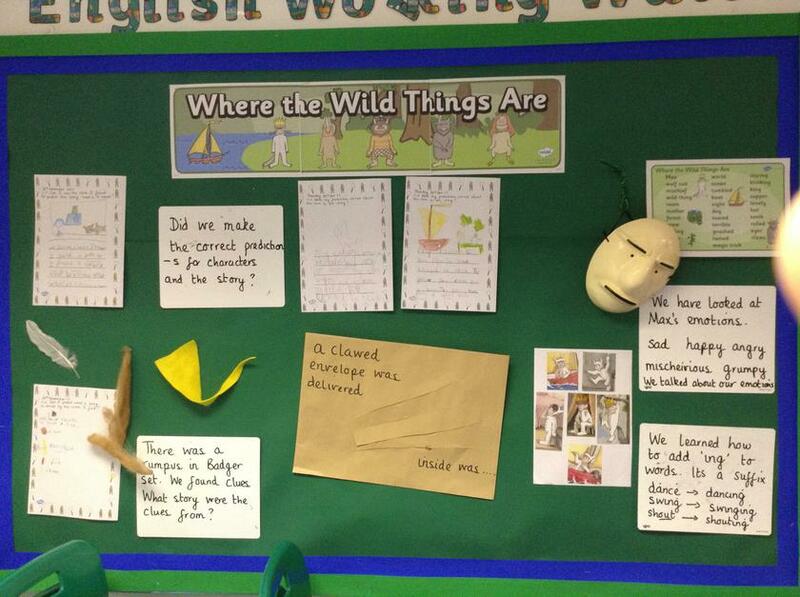 The Year 1 Badgers have worked hard in English exploring the story of 'Where the Wild Things Are.' They have learnt how to add the suffix 'ing' to root words and used this knowledge to write a descriptive passage on their own wild thing that they have created. Today in Year R we have been very excited to see the beginning of advent and have opened door 1 on our advent calendar that we have made. 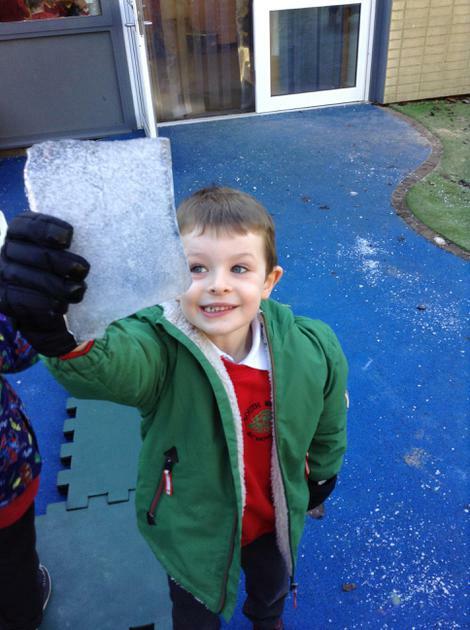 This week we have enjoyed learning about ice and the cold weather has given us lots of opportunities to do this. 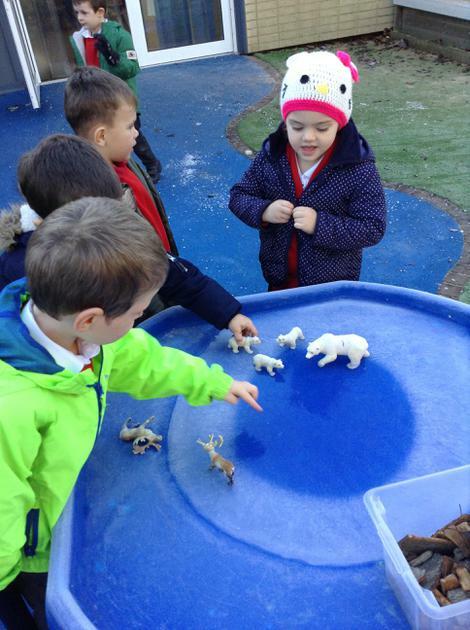 On Thursday we found our arctic animals frozen in the ice and we worked together to find ways to set them free. We discovered that we could melt the ice by breaking and holding it, putting the ice in the sun and running the ice under warm water. We are also working hard on learning all our Christmas songs in readiness for the upcoming play. In Year 1 we had a mysterious clawed envelope delivered to our classroom and we had to discover which character sent this to us from the book, 'Where the Wild Things Are.' They left lots of clues behind which we investigated fully and then we wrote out our predictions before we arrived at our final conclusions. We have also been exploring different emotions related to characters from the story and enjoyed expressing these during a drama session. 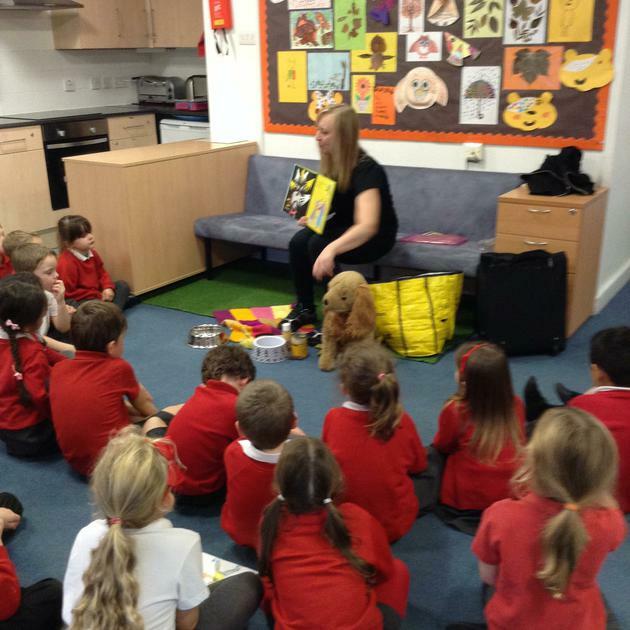 This week we had a visit from the Dogs Trust who taught us about looking after and caring for dogs. We had a lovely time listening to a story and sharing our own experiences of dogs and puppies. 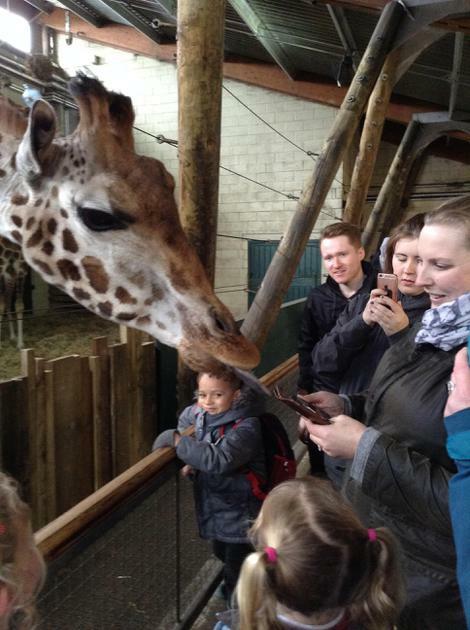 We have also enjoyed our visits to the Life Education Bus and meeting Harold the Giraffe. Harold taught us all about how our bodies make energy and the types of food we must eat to help us grow. 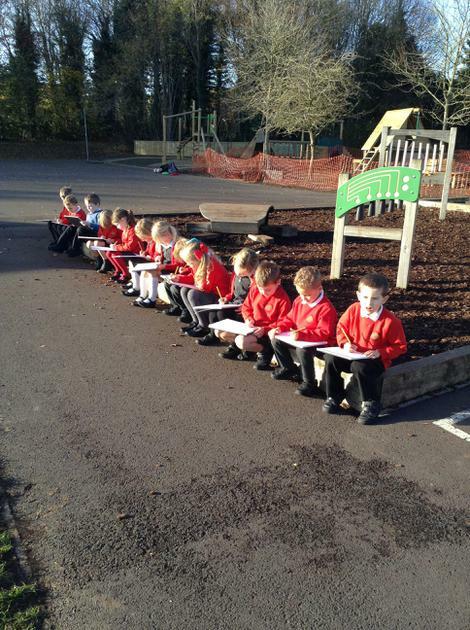 Year R/1 have also spent time thinking about landscapes and made sketches of the landscapes surrounding our school. 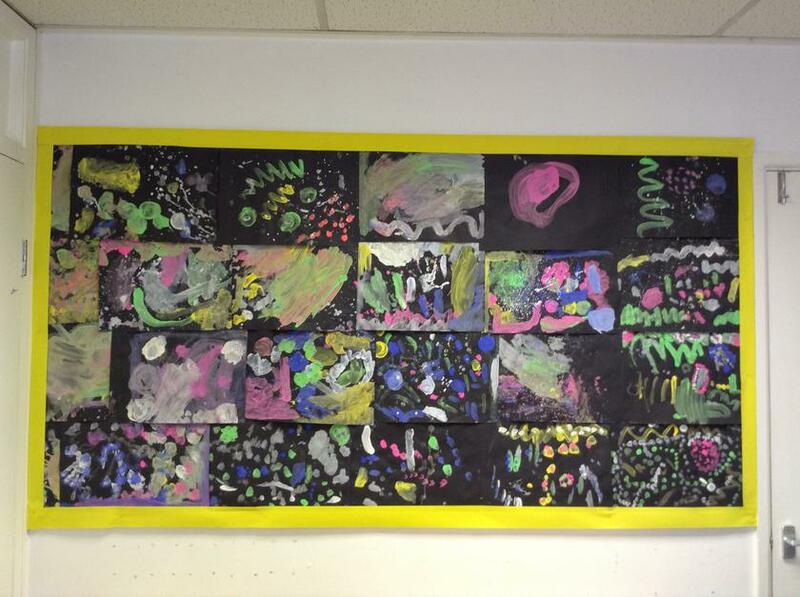 We made these sketches in our art books and some of these we replicated on the playground using chalk. 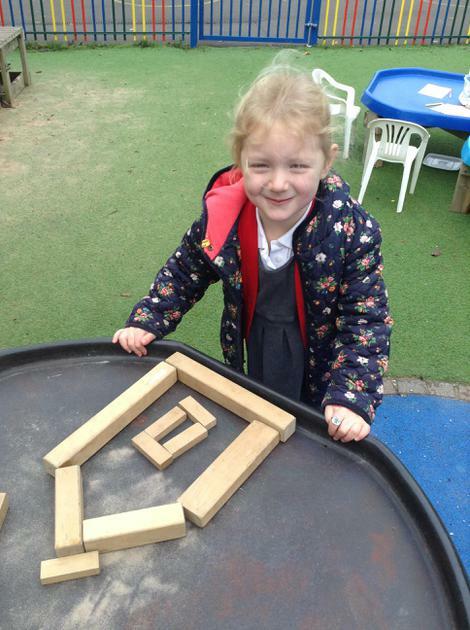 This week the Year R children have been looking at and exploring the properties of a variety of 2d shapes. 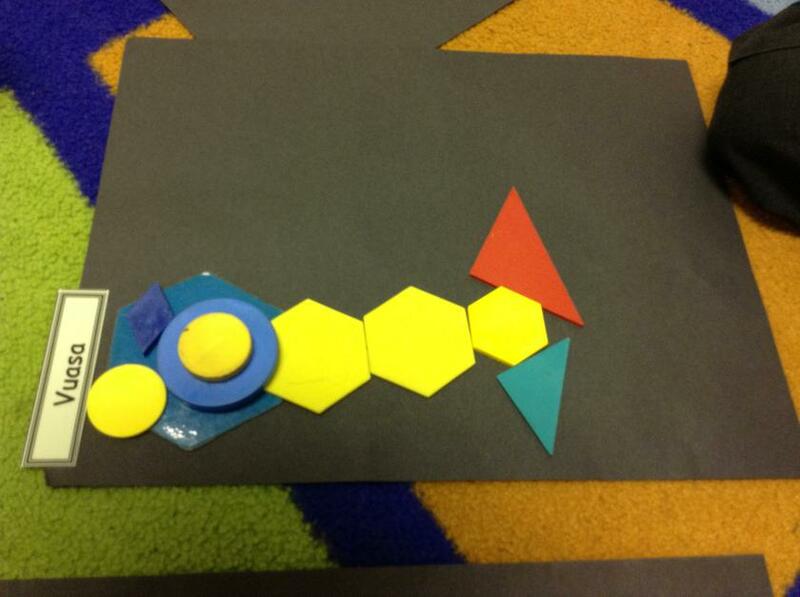 They have used these shapes to create their own pictures. 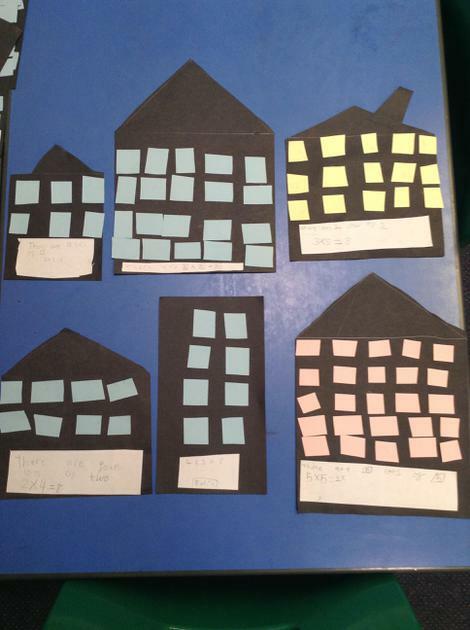 We have been talking about our own homes during class discussions and making lists of the people who live with us. 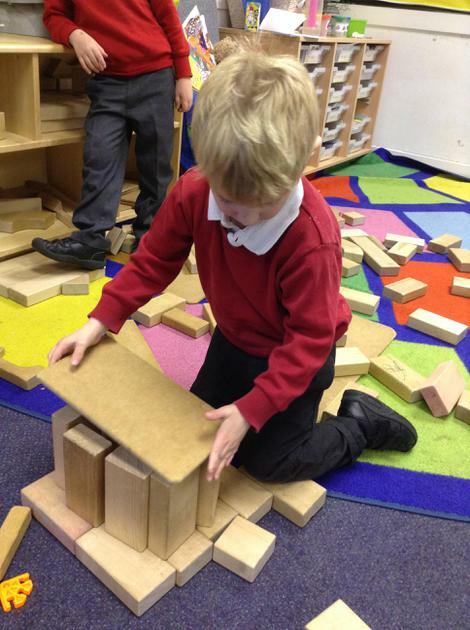 The children have also been creating house structures using wooden 3d shaped blocks. In Year 1 the children have been discussing the differences between our four seasons and working in a group to create brainstorms about what they already know. The children then presented their information to the rest of the group and were able to project their voices well so that all their information could be heard. In Maths we have continued working with money, focusing on the value of different coins. 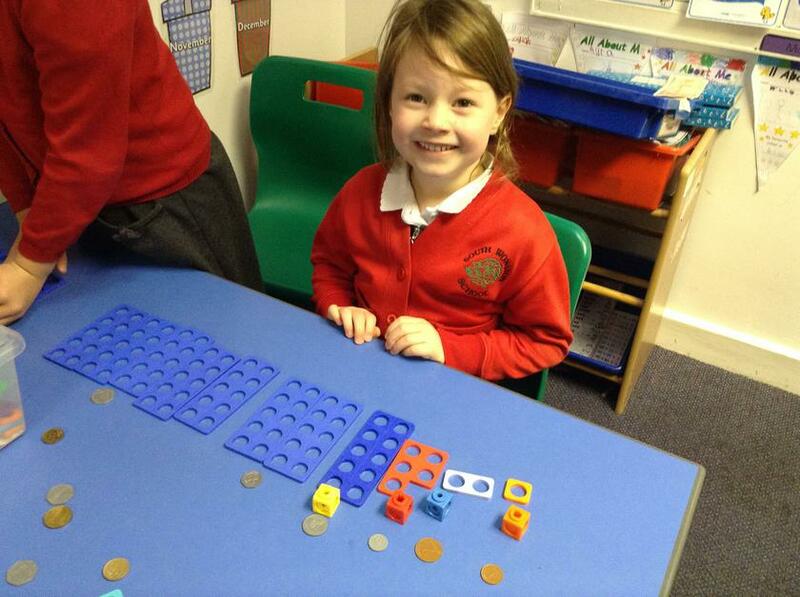 The children have used Numicon equipment to explain and show the values of each coin. 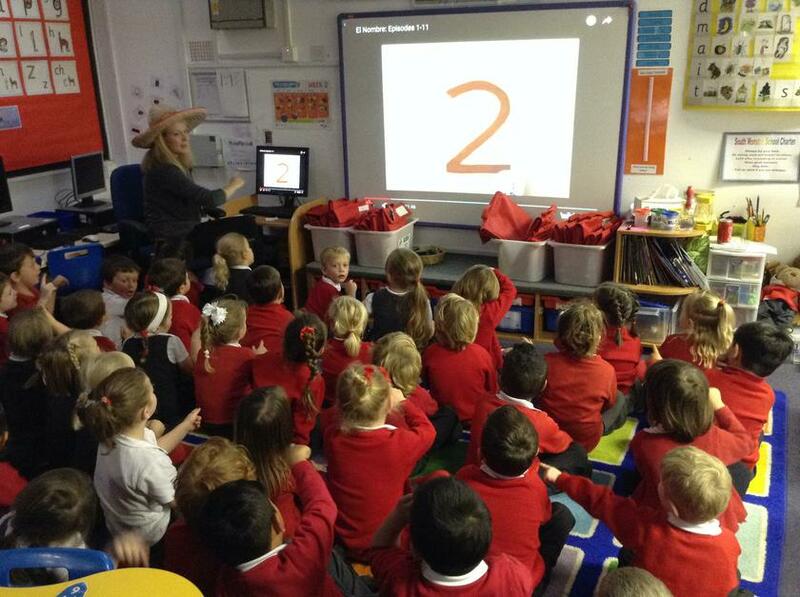 This week the children have enjoyed watching 'El Nombre,' and learning how to use the Numicon maths equipment. They have been using this equipment to represent numbers in different ways alongside reciting the number rhymes we have learnt so far. This has really helped with their number formations and we have been really impressed with how they have taken to this with such enthusiasm. The Year R children have also been experimenting with different brush techniques to create a fabulous firework scene on one of our display boards. 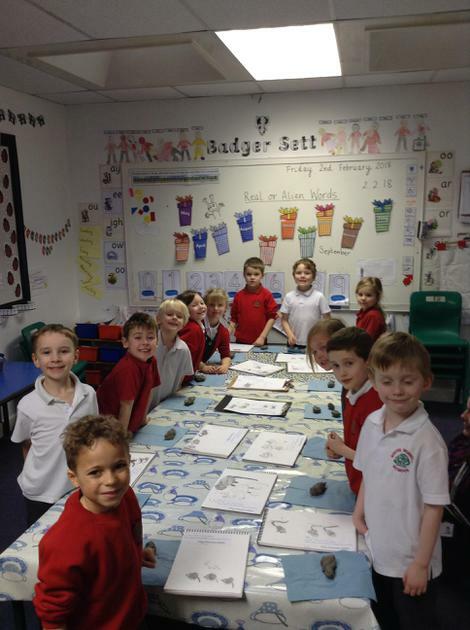 The Year 1 Badgers have been working on their poetry writing skills during English this week. 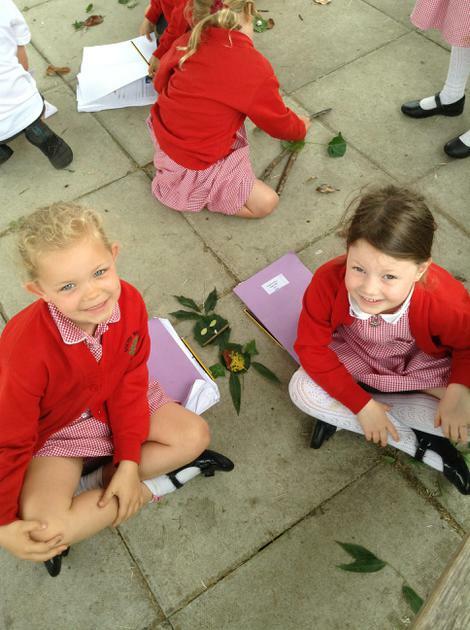 They have created some exciting poems based on Autumn and fireworks, which are going to be used for a school display. In Maths we have been focusing on recognising the value of coins and using money to make varying amounts. 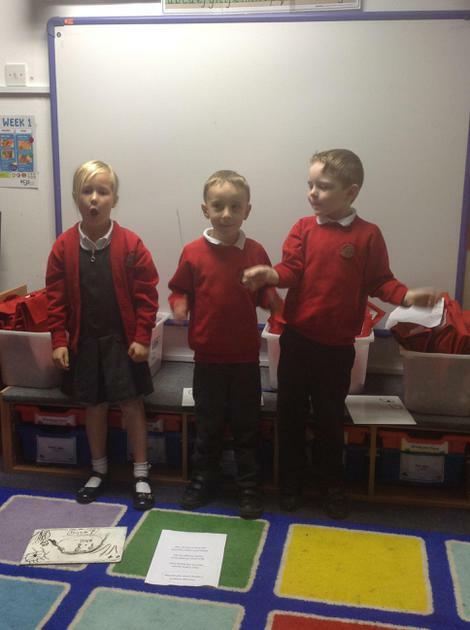 Year 1 Badgers have spent this week learning how to read and perform firework poems. 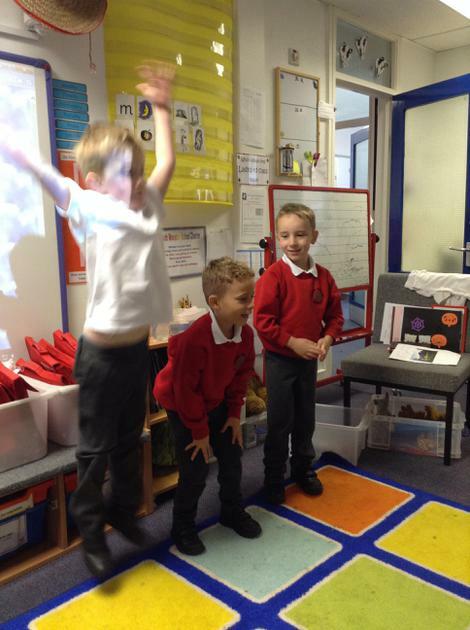 They learned how to project their voices and were confident in reciting the poems to an audience.They even added interesting and exciting actions! 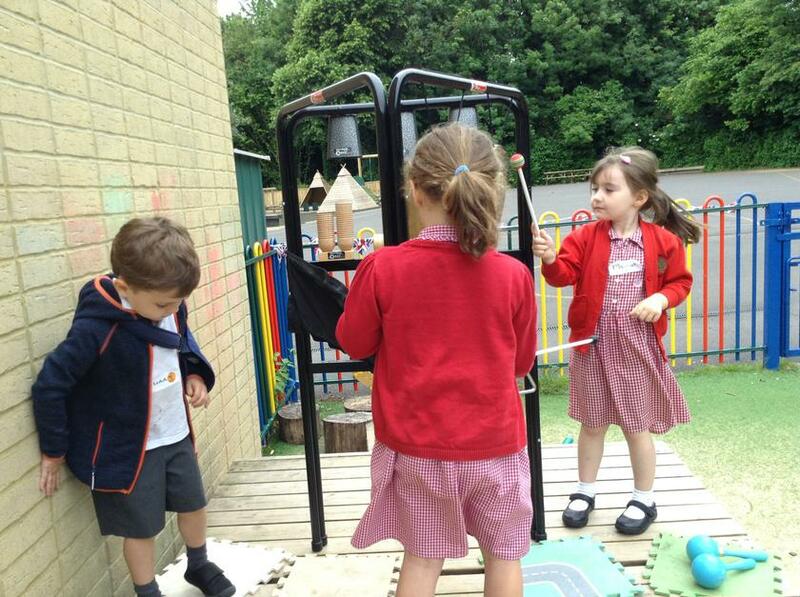 They have also begun to look at different measures such as height, capacity and time . and looking at objects that start with the sound and writing the sound. 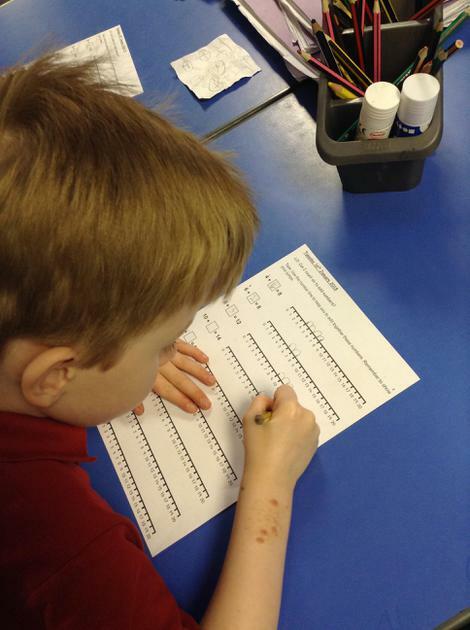 We love taking our phonic sheets home to continue practising. 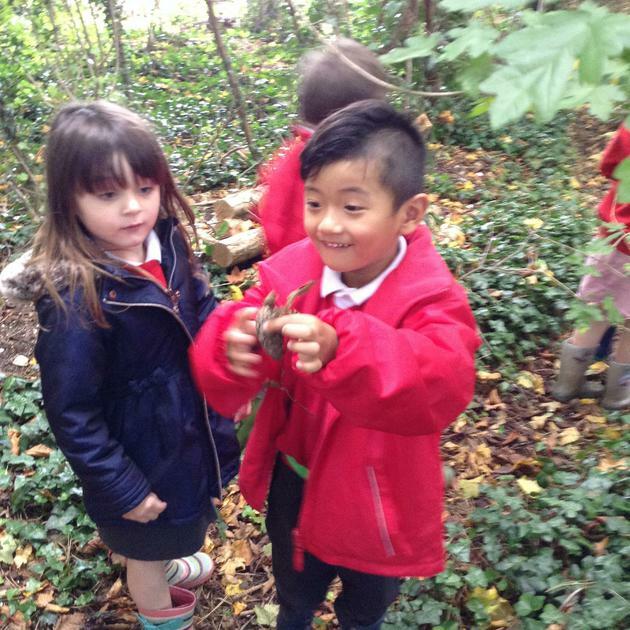 The Year R children have been using their senses to spot all the signs of Autumn while on a walk around the school grounds. 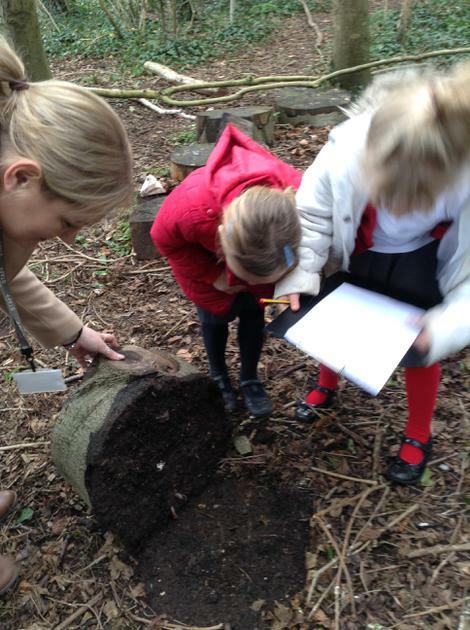 We collected many autumnal items and have looked at these items more closely during class and group discussions. 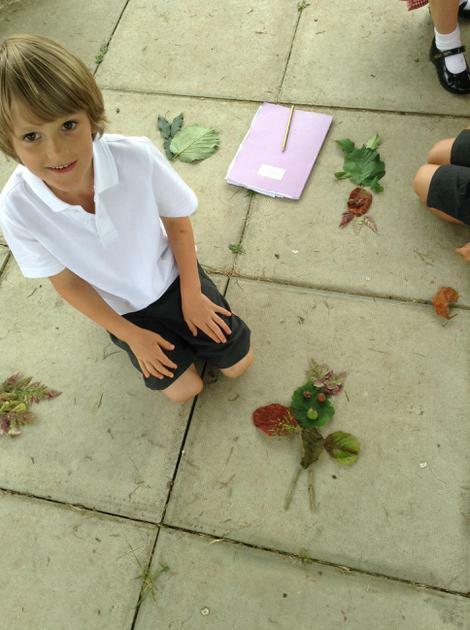 In our creation station we have used our Autumn leaves to make our very own creative artwork. 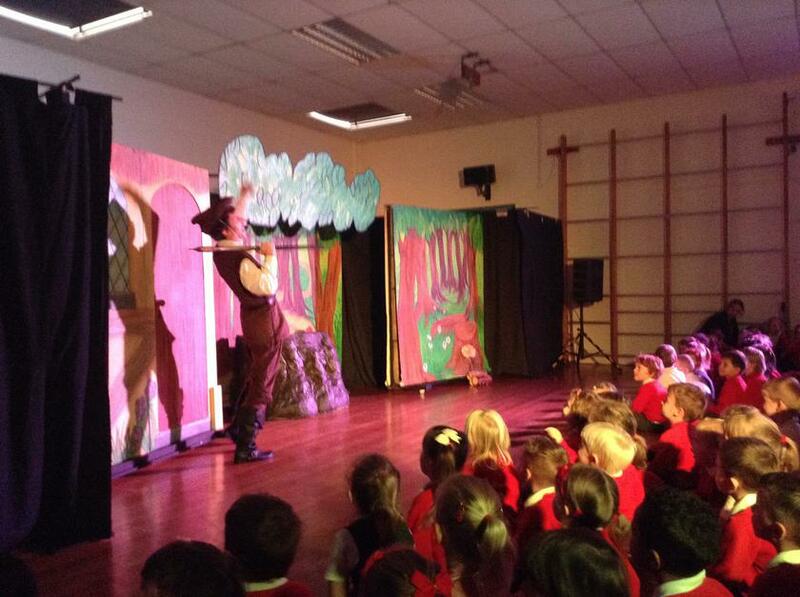 The whole school loved watching the production of The Jack and the Beanstalk that came to school on Wednesday. It was a real treat! 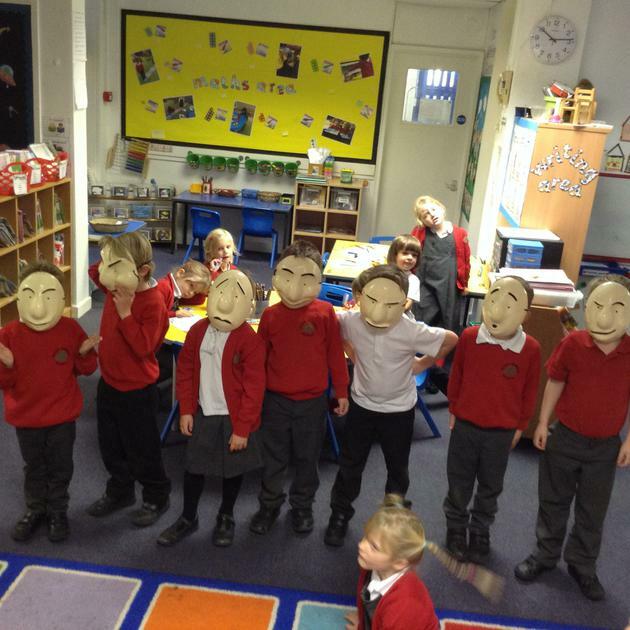 We all enjoyed discussing our favourite parts and in Year 1 we were able to write our own stories based on the play. 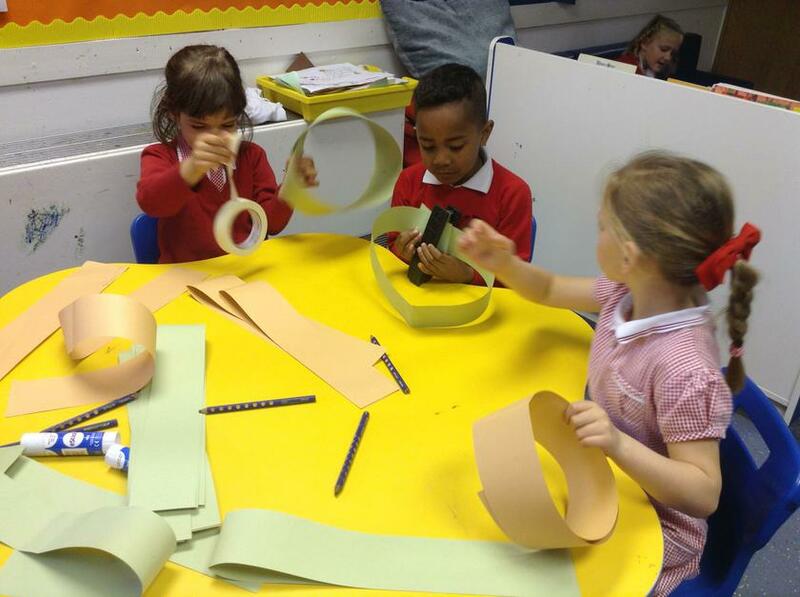 In Year 1 we have been designing and making our own puppets. 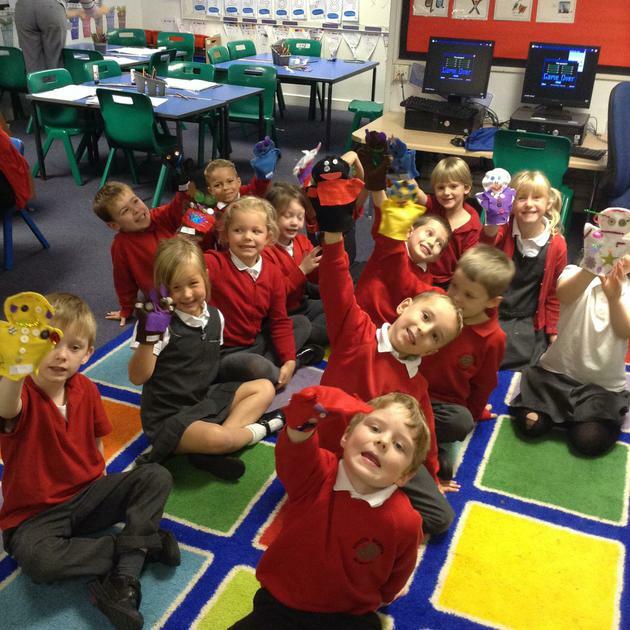 We had to work carefully by sewing our puppets together using a variety of materials and then we decorated them to give them their own unique features. In groups we created our own puppet shows and then performed these to the Year R children. This week lots of boys found opportunities to practise their writing. They kept scores during a tennis match and then wrote about lots of different things in the writing area. 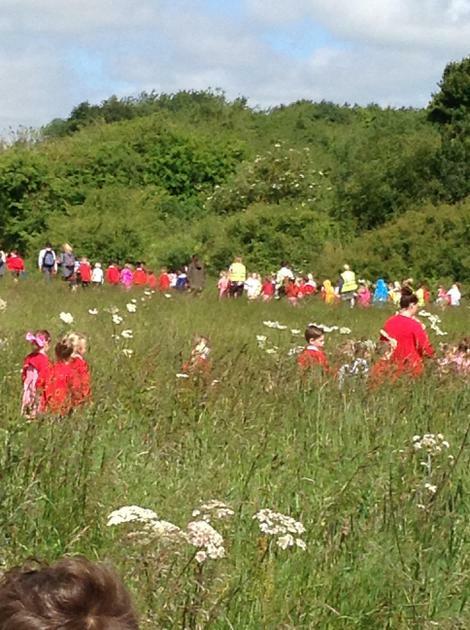 We all took part in the PTA sponsored Golden Mile Event on Monday . 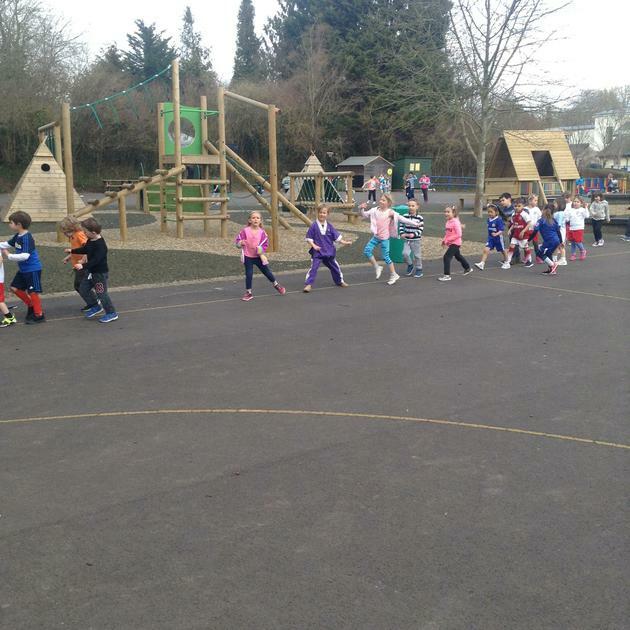 All of the children did a warm up, and then the children were very fit and did 15 laps of the running track . They showed great determination and persistence. 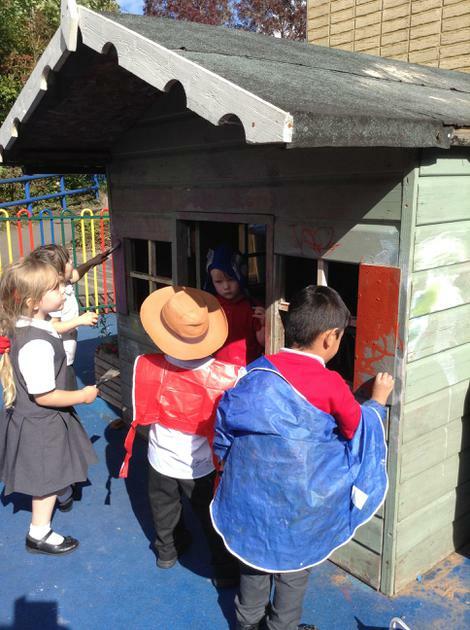 In Year R the children have been exploring the two new role play areas. In the inside classrooms we have a Vets and the children have enjoyed role-playing different characters and learning how to care for the pets. 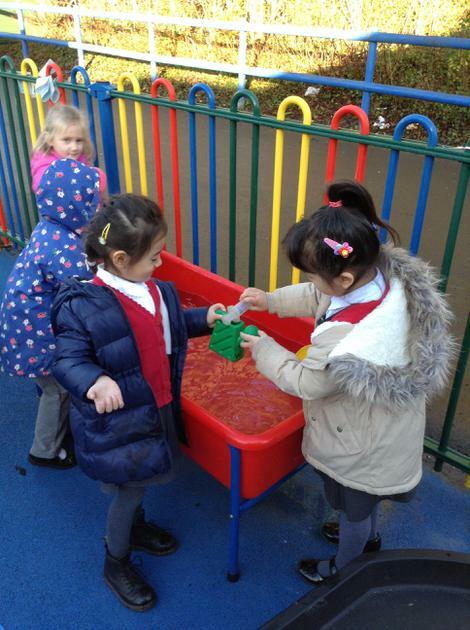 While in the outside classroom the children have been learning in our new Toy Shop; they have taken on the roles of customers and shopkeepers and have been using coins to pay for their purchases. 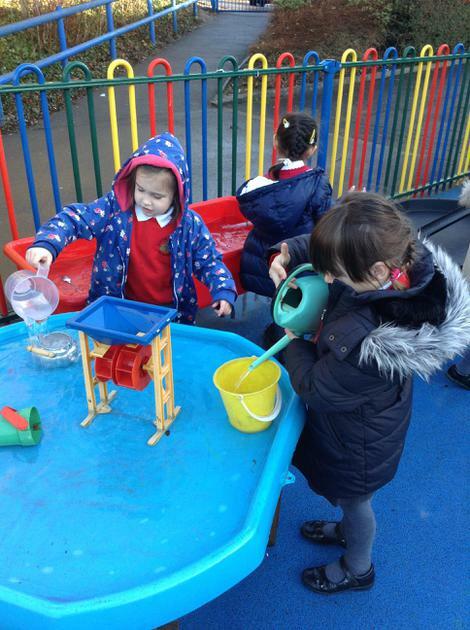 Furthermore, the children have been fascinated with the water play this week, creating homes for the dinosaurs and safe places for their dinosaur eggs to hatch. The Year 1 Badgers have been reading and retelling the traditional story of The Three Little Pigs using a variety of different mediums. In I.C.T. they have begun creating an animation of the story using the computer software, we are really excited about watching their completed animations! 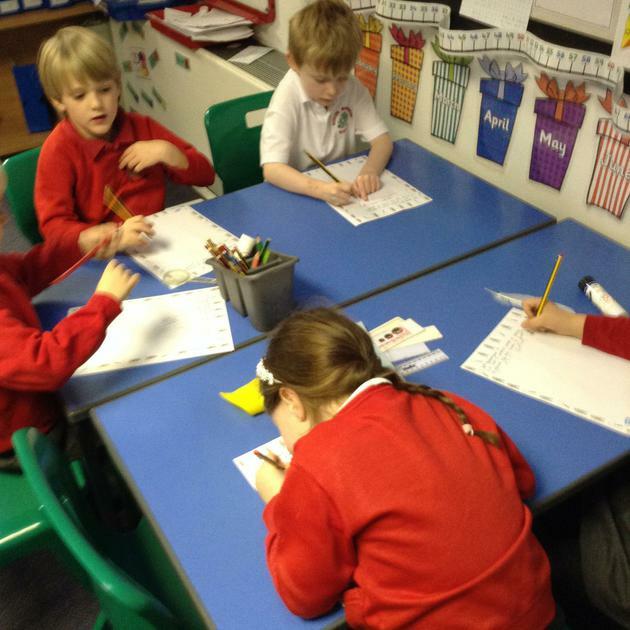 The children have also been working together to create word banks of adjectives on the main characters from the story and using these to enhance their writing. In Maths we have been continuing investigating ways of calculating our number bonds using subtraction methods and solving addition and subtraction word problems. We have been practicing counting in two's. 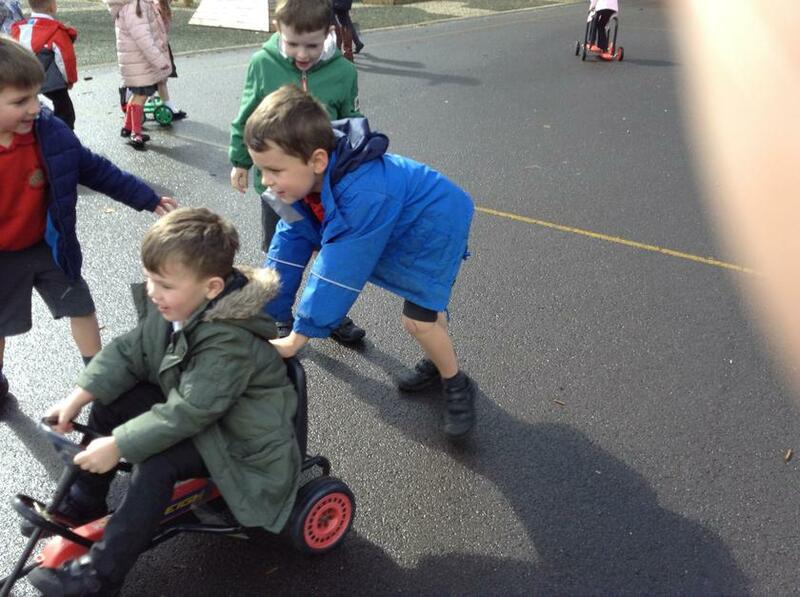 Year R have been learning how to work as part of a team. They have taken on lots of roles and responsibilities. 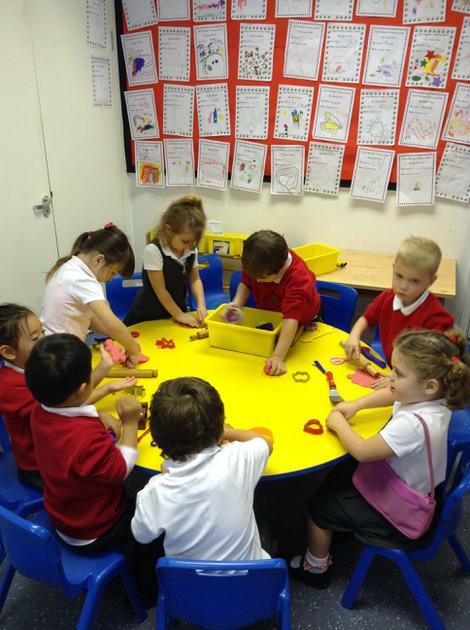 The children have learnt how to make playdoh and share it well. 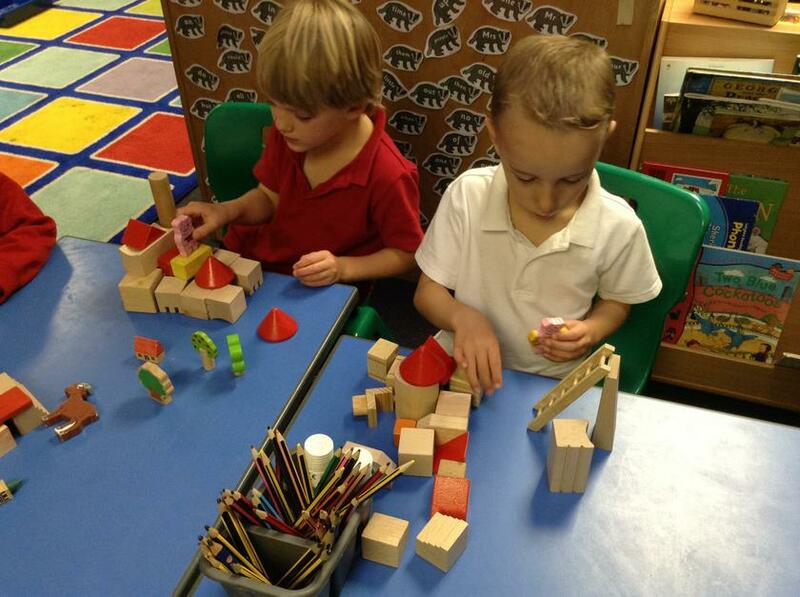 They have been sharing lots of different resources and creating great imaginary games and stories together. These have included going on buses for an adventure and repainting the house so it looked like a rainbow! 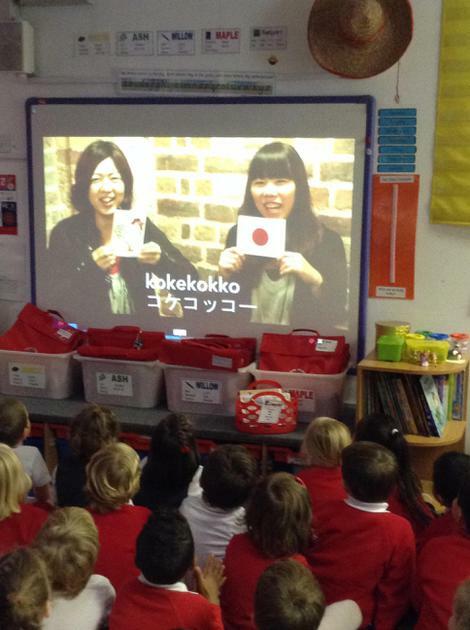 Year R and Year 1 enjoyed languages day . 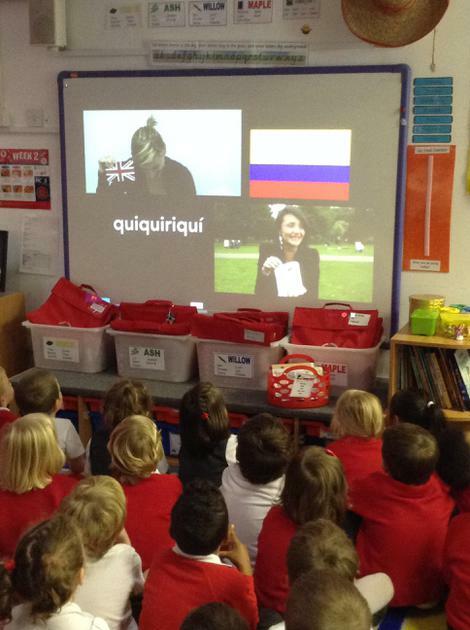 We found out that people say animal noises differently in each country. This week we have focused on learning addition number bonds to 10 and have used Numicon to help us. We recorded these sums using number sentences and bar models.They have also enacted Goldilocks and the Three Bears using puppets, small world, masks and playdoh. They became good story tellers and used different voices for their characters. Year R have had a fantastic second week at school. 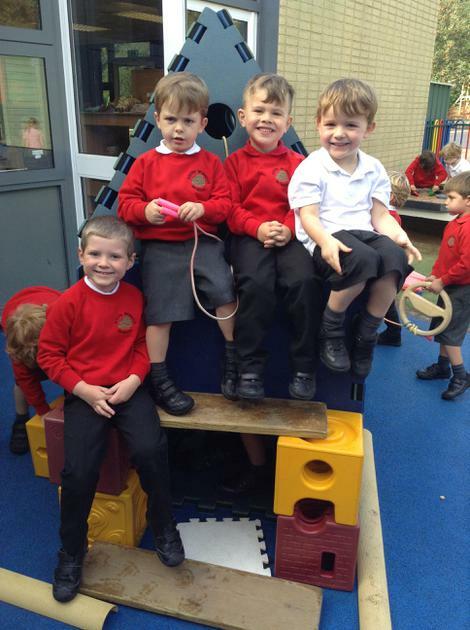 They have have created lots of adventures outside . Some children have used the large construction to make a fishing boat which even included an anchor so that they could stop and fish. 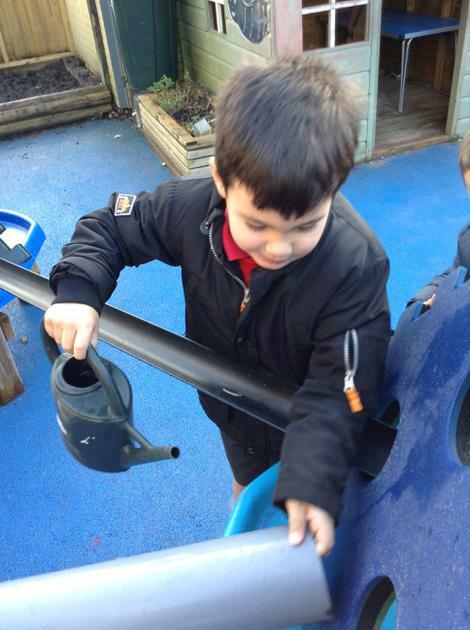 Other children used the guttering and water to make pathways for boats and animals . We all got very wet!!!! 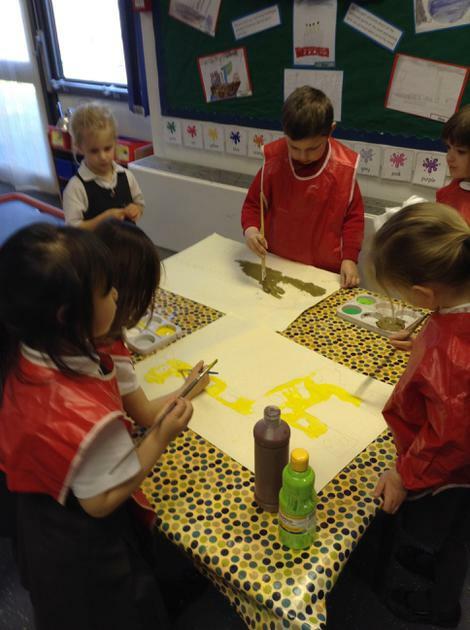 The Year 1 children have been working so hard this week. 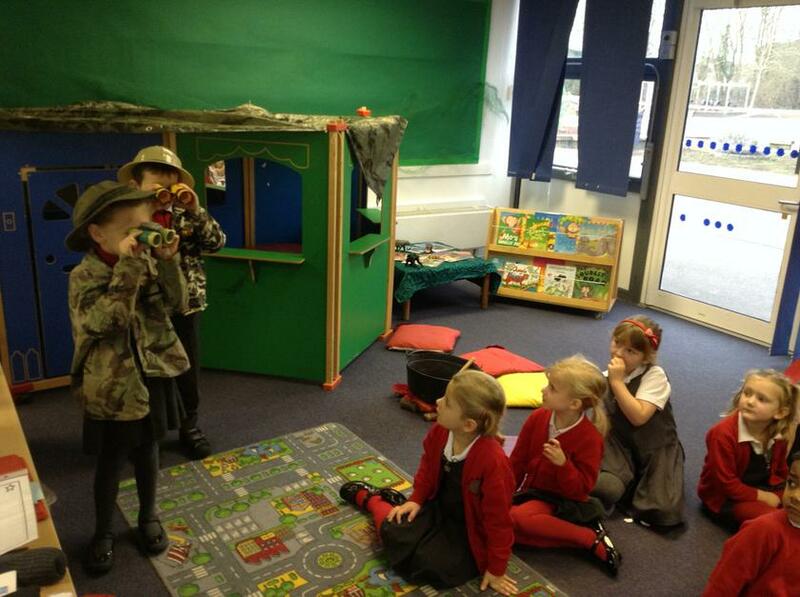 They have listened to stories about bears , red riding hood and ogres and acted these stories out with their friends . Today they wrote their own story with these characters, using the conjunction 'and'. 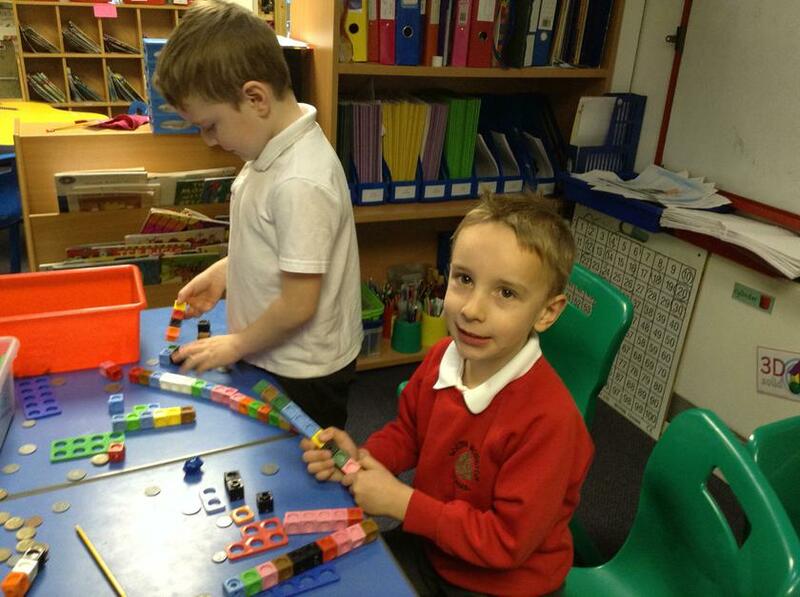 In Maths the children have been exploring addition using Numicon. 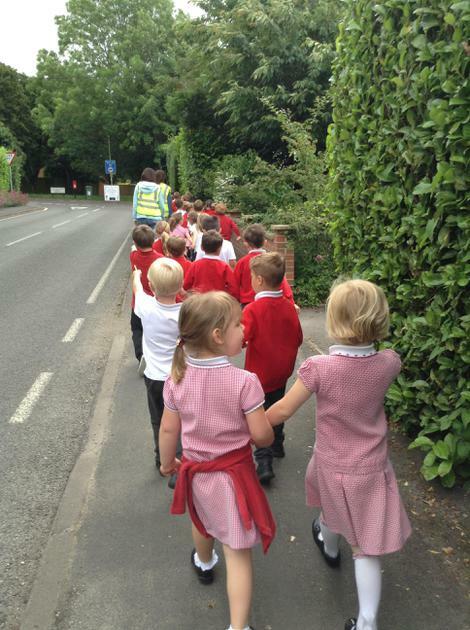 We have had a lovely first week welcoming our new Year R Ladybirds to South Wonston Primary School. All the staff have been very impressed at their independence coming into school and we are very proud of them! 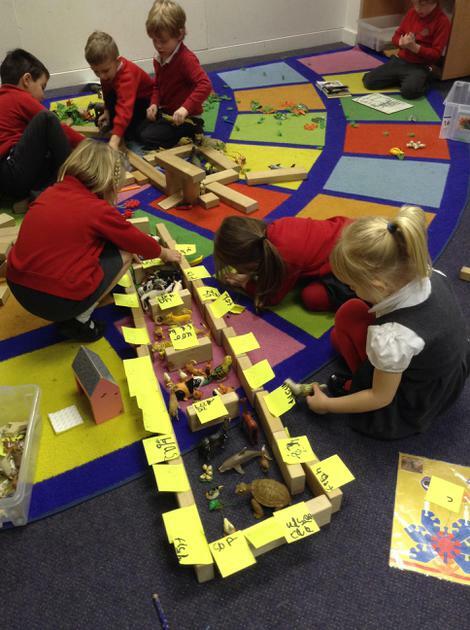 Our Year 1 Badgers have also been busy exploring our new topic of old and new toys. It has been lovely sharing their favourite toys and discovering what materials they are made from. 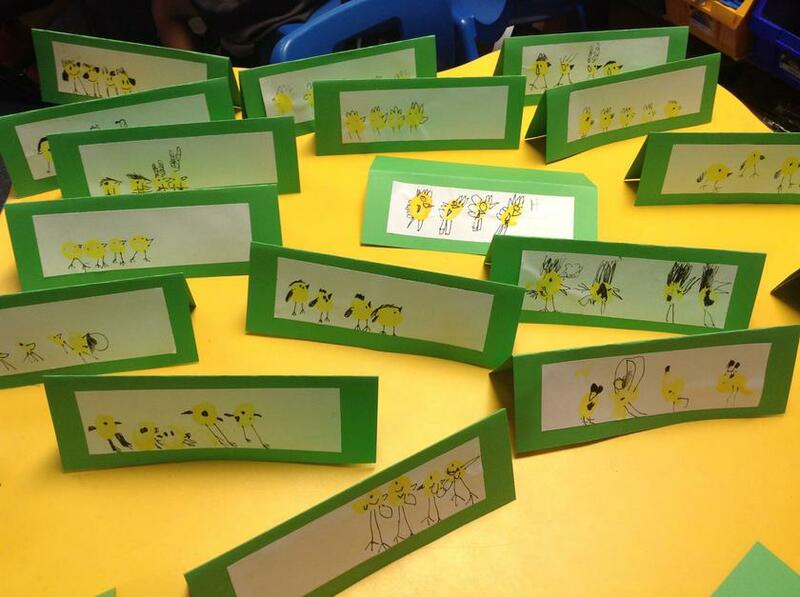 In English, the Year 1 Badgers have been reading stories and tales about bears and developing their sentence writing skills in response to them. During Maths we have been focusing on number ordering and finding one more or less than a given number.